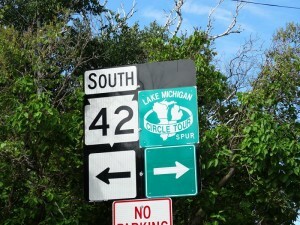 Quickie Summary: State “Trunk” Highway 42 is a popular route into Door County. 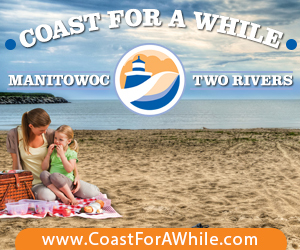 From Sheboygan to Manitowoc, it’s a relatively minor route, but from Manitowoc on north it assumes a major role for vacationers looking to take advantage of Lake Michigan’s shores and Door County’s offerings. 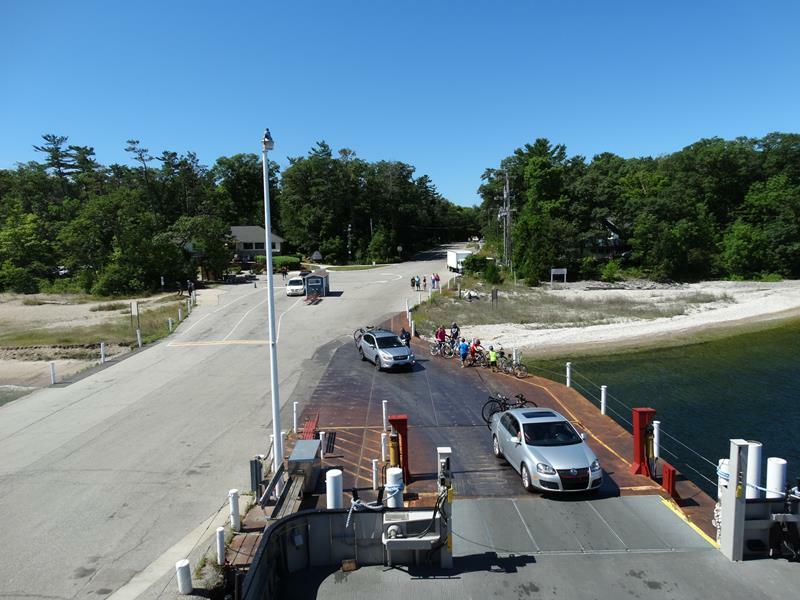 Highway 42 makes it all the way to the tip of the Door Peninsula, finishing with a mile of squiggles and a ferry dock to Washington Island. It used to go all the way south to Chicago too, but that’s a story for another time. 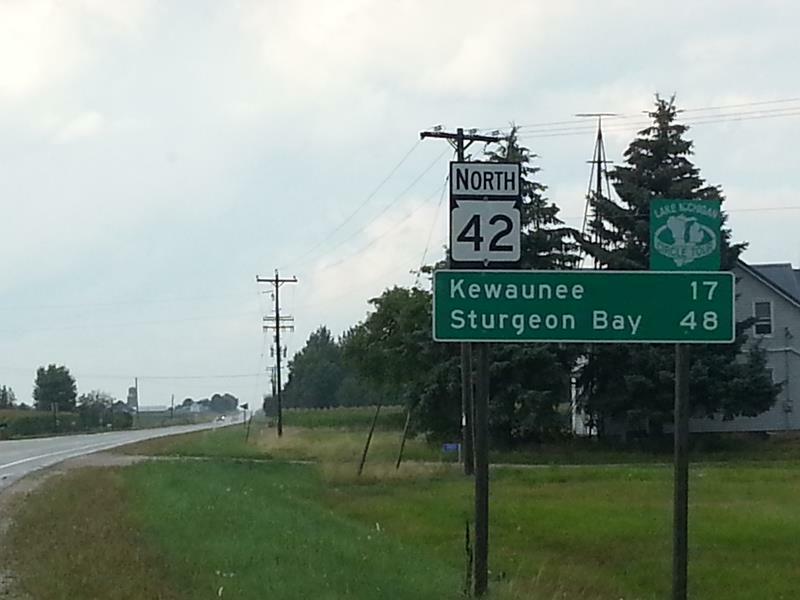 The Drive (South To North): Highway 42 begins in Sheboygan at the western edge of its downtown, where Highway 23, which enters Sheboygan from the west, and Highway 28, which comes in from the southwest, come together at 14th Street, Erie and Kohler Memorial Drive. 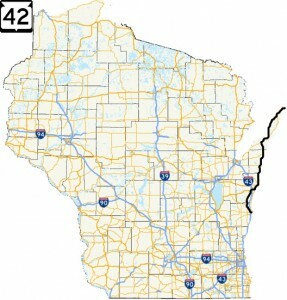 Highway 42 is the road extending northwest from Sheboygan, which it does as Calumet Avenue. 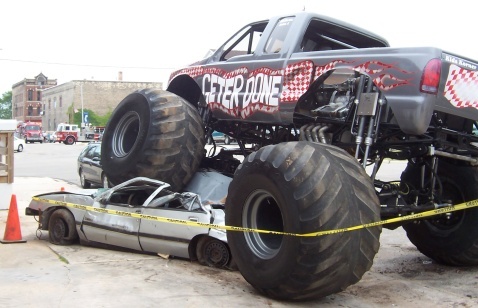 But first, be sure to check out Sheboygan! Sheboygan (pop. 50,792) is the Bratwurst Capital of the World. 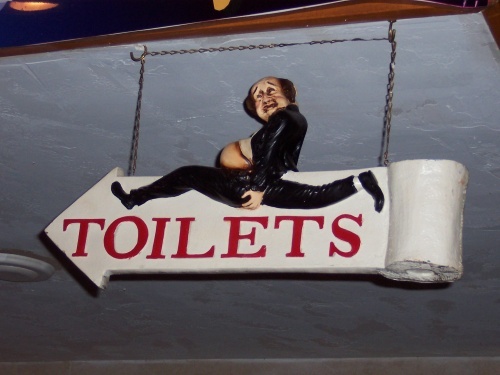 They make toilets too; it’s the circle of life. 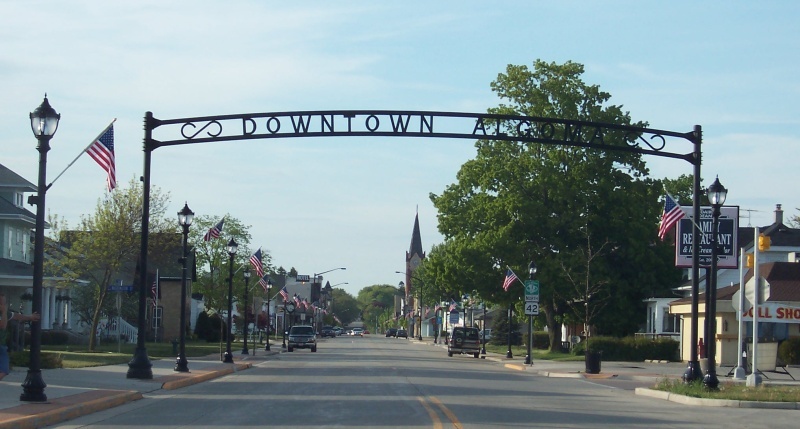 Large enough to have “suburbs” like Kohler and the Sheboygan Falls, the area is home to a number of major companies, including Kohler, Acuity Insurance, Johnsonville Sausage, and Bemis. Comedian Jackie Mason, basketball coach Rick Majerus, and the Chordettes (the ’50s group that sang “Lollipop”) all hail from Sheboygan. The city was referenced in the classic 1959 film Some Like It Hot when Daphne & Josephine (Jack Lemmon and Tony Curtis) claimed to Marilyn Monroe they had studied music at the “Sheboygan Conservatory.” The movies Home Alone, A Kid in Aladdin’s Place, World Trade Center and Surf’s Up all reference the city. There was even a board game in 1979 called The Creature That Ate Sheboygan – who no doubt consumed a lot of bratwurst during that meal. 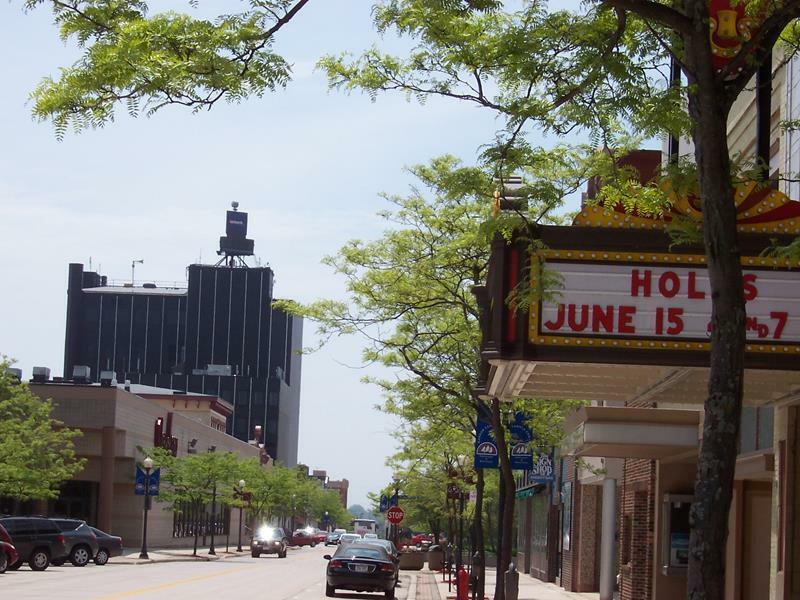 Mattel even claims that the iconic Barbie, their signature doll’s character, hails from the fictitious Willows, Wisconsin – a city claimed by many to be based on Sheboygan. The city even had an NBA team called the Sheboygan Redskins back in the ’40s. It’s also consistently named one of the best places to raise a family and, interestingly enough, one of the best places to retire, in the U.S. Points of interest are quite plentiful considering the city’s size. The John Michael Kohler Arts Center (608 New York Avenue, 920-458-6144) hosts galleries chock full of innovative explorations in the arts. Rather than only showing historical artistic pieces, the center works to foster new concepts and forms of artistic creation. It’s definitely worth a stop. One of the reasons Sheboygan is considered a good place to retire is the plethora of golf courses. Incredible courses like Whistling Straits bring worldwide acclaim and establish Sheboygan as a premier place for golf. Nestled along a two-mile stretch of Lake Michigan north of the city along County LS, Whistling Straits reminds most golfers of the classic olde links in Scotland and Ireland. Whistling Straits hosted PGA Championships in 2004, 2010, and 2015, and will host the Ryder Cup in 2020. Surf’s Up! 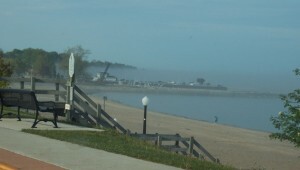 Sheboygan’s Lake Michigan “surf” is considered among the best in the country. The Dairyland Surf Classic helped give Sheboygan its reputation as the “Malibu of the Midwest” and yes, dudes from California even come in for it. From Kohler-Andrae State Park north past downtown to the Whistling Straits course area, Sheboygan makes good use of its lakefront. Sheboygan’s Dairyland Surf Classic was the largest freshwater surfing competition in the world until it ceased in 2013. Charter fishing, pleasure boating and, further out, freshwater surfing are all popular in Sheboygan. 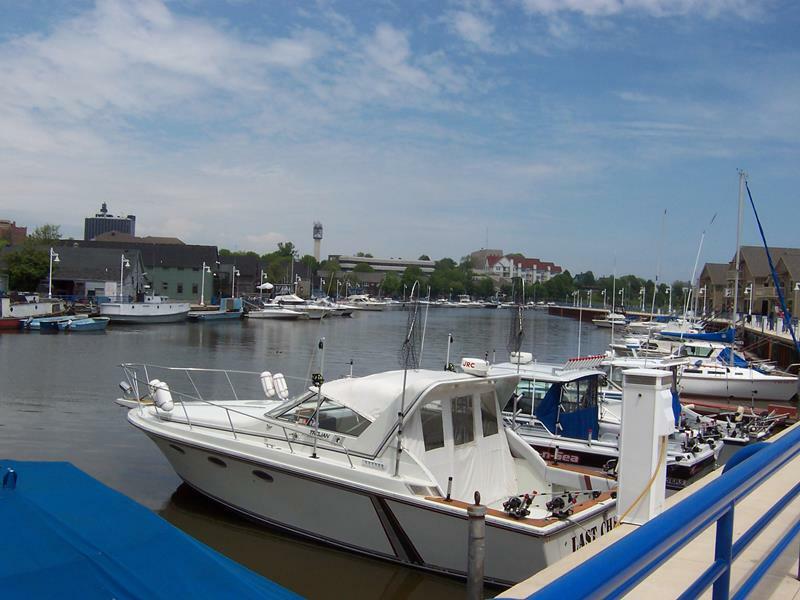 The Sheboygan River provides plenty of space for docking and the harbor area is brimming with shops, attractions and new condos. 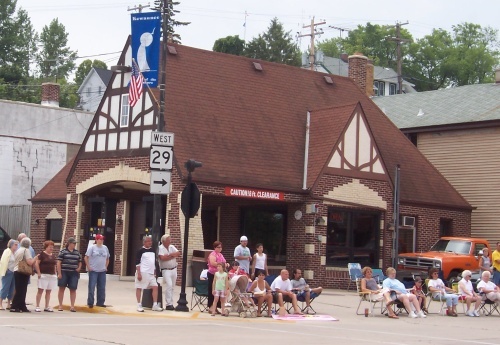 A popular annual event is Brat Days, which takes place the first weekend in August. During its 2006 celebration, the city hosted the International Federation of Competitive Eating and Takeru Kobayashi broke the world bratwurst-eating record by downing 58 brats in 10 minutes against heavy competition, live on ESPN. Sales of antacids were massive in town that night. One of the largest bars in Sheboygan and former home to the Port Washington Brewing Company, Hops Haven Brew Haus (920-457-HOPS) on Highway 42 – just blocks north of its start – is a good place to check out. Hops Haven was established in 2003 in a century-old building that houses a restaurant, the brewery and plenty of room to play games and watch sports while taking in some fresh Sheboygan-based brews. The rapidly-growing 3 Sheeps Brewing Company started in Hops Haven and since moved to a larger facility along North Avenue, about half a mile east of Highway 42. 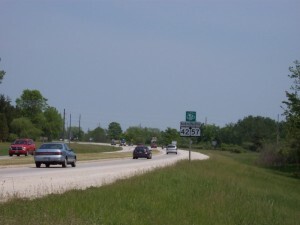 From its southern origin, Highway 42 shoots out of Sheboygan, crossing I-43 in the midst of a sea of roundabouts and then beelining northwest to Howards Grove (pop. 2,973). At the main crossroads, Highway 32 meets up and takes over the northwestern direction; Highway 42 turns north on a lightly-traveled stretch, since most through traffic uses I-43. Eventually Highway 42 meets up with U.S. Highway 151 and I-43 again after its 19-mile inland march. Highway 42 through Howards Grove after the junction with Highway 32. This starts a pretty quiet stretch all the way to Manitowoc, as most Sheboygan-Manty traffic uses I-43. 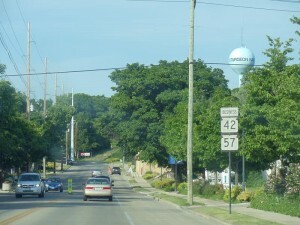 Highway 42 approaches Manitowoc (pop. 34,053) and hops onto I-43 for three miles before joining U.S. Highway 10 and heading east into the city’s north side as Waldo Blvd. Traditionally, Highway 42 headed straight into town from the southwest; the original route is now Business 42, which is a more interesting route for exploring the city. The map on the left shows where Highway 42 goes today (solid line) vs. its traditional route into the city (Business 42, dashed), which follows U.S. 151 downtown and then uses 8th Street northbound (which is also U.S. 10) back north to Waldo Blvd. Go into town, of course, so you can see all the cool stuff! Manitowoc itself is world headquarters for the Lakeside Foods Company and the Manitowoc Company, a major manufacturer of cranes, ice machines and refrigeration equipment. It also constructs ships, and the city’s main high school nickname reflects it as the “Shipbuilders”, a rather unique high school name. The “Subs” would also be a fitting name, since 28 submarines were built here, the only inland shipyard to do so. 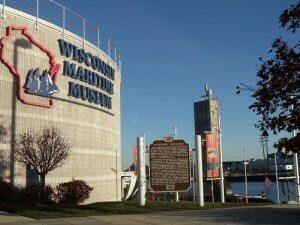 The nautical theme continues with the fact that Manitowoc is the western terminal for the S.S. Badger, a car ferry ship that carries U.S. 10 across the lake to Ludington, Michigan, and that the city holds the Wisconsin Maritime Museum, one of the nation’s most extensive museums for Great Lakes maritime history and nautical archeology. Great guns! 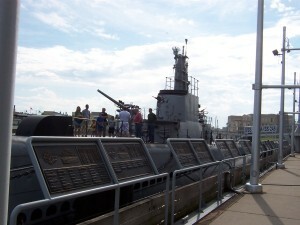 The USS Cobia is in the water and on display at the Wisconsin Maritime Museum in downtown Manitowoc. If you go, check out the USS Cobia, a naval submarine permanently docked in the Manitowoc River at the museum, right before the Lake Michigan shoreline. All of this is in downtown Manitowoc, which lies just south of today’s Highway 42 but goes right along “Business” 42, which you should be following anyway. If you’re on Waldo Blvd, follow U.S. 10 south via 9th Street to access the museum and the rest of the city’s downtown. 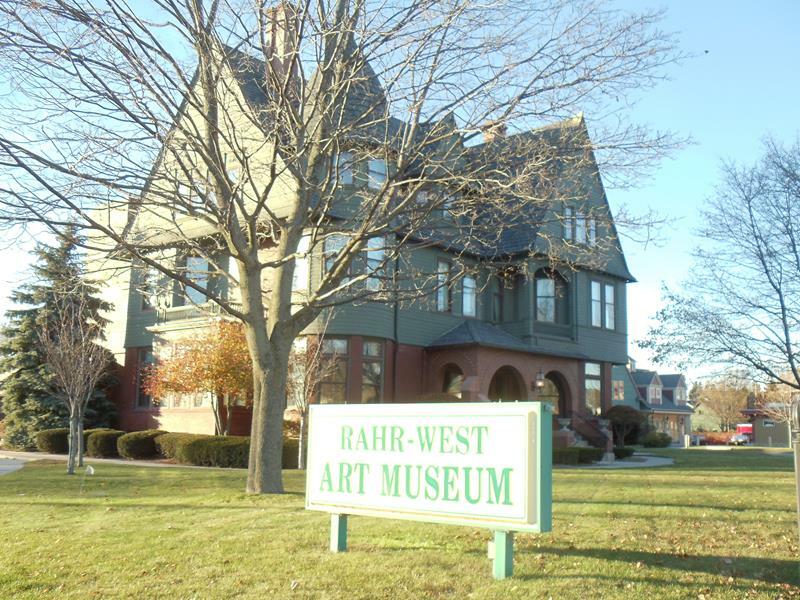 While you’re going downtown, check out the Rahr-West Art Museum and the brass ring in front of it. At 610 N. 8th Street (the northbound side of U.S. 10 and Business 42), you can check out a variety of visual arts and exhibits, as well as a piece of Sputnik – yes, the Soviet satellite! A 20-pound piece of it, the only one surviving re-entry into the atmosphere, crashed to earth in 1962 and just happened to pick the middle stripe of 8th Street in Manitowoc for its landing. 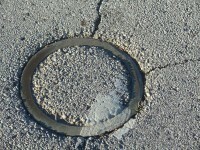 Sputnik’s unintended landing site, on a Manitowoc street. 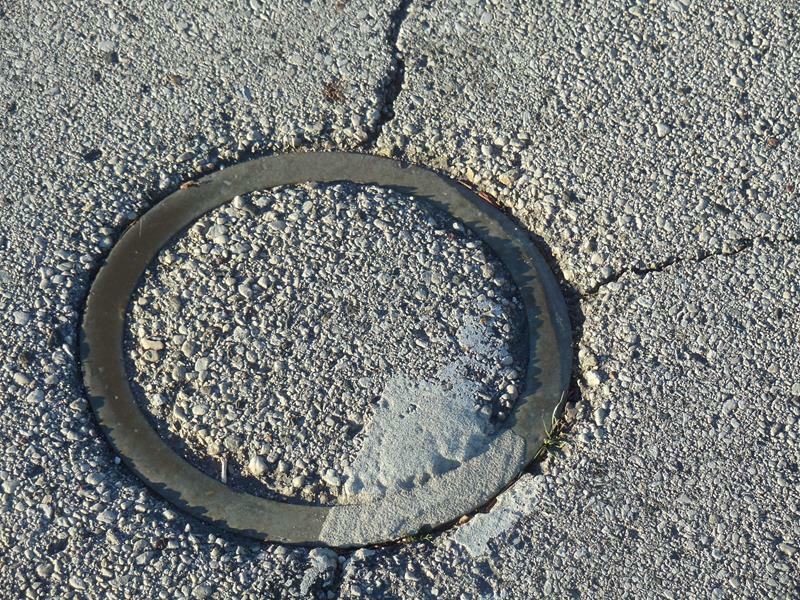 What some may simply assume is a manhole cover is actually a brass ring, marking the spot where the chunk of Russian craft, reportedly “still glowing” when police found it, landed. It’s right in front of the Rahr-West Art Museum. The original chunk was returned to the Soviets (one can only imagine… “um, here, this is what’s left of your satellite”), but a good replica is available for viewing in the museum. There’s also an annual Sputnik Fest now in Manitowoc, taking place every September. 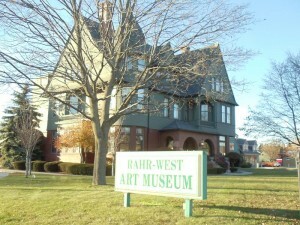 The beautiful Rahr-West Art Museum, located in a former mansion. It not only holds great collections of artworks, but narrowly missed being hit by a chunk of falling Soviet spacecraft in 1962. A sugary Manitowoc staple since 1932: Beerntsen’s. 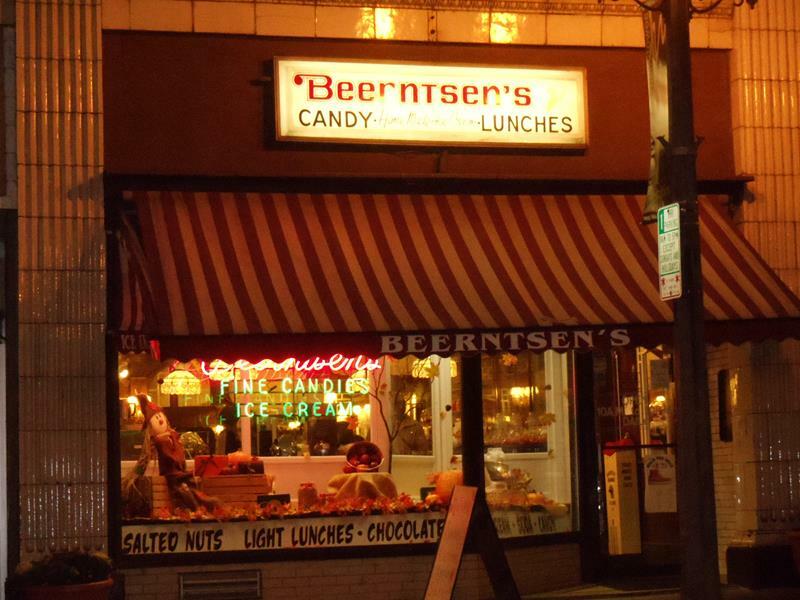 If the chocolate monster within you needs satisfaction, check out Beerntsen’s Confectionary (108 N. 8th Street, 920-684-9616), a local favorite since 1932. 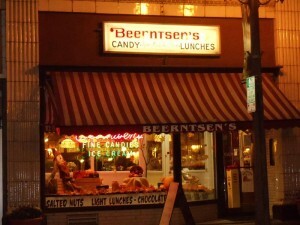 Beerntsen’s maintains the ice cream parlor atmosphere in their original location; meanwhile, they ship their chocolates to other parts of the state, including the tony American Club in Kohler, which features Beerntsen’s in their gift shop. 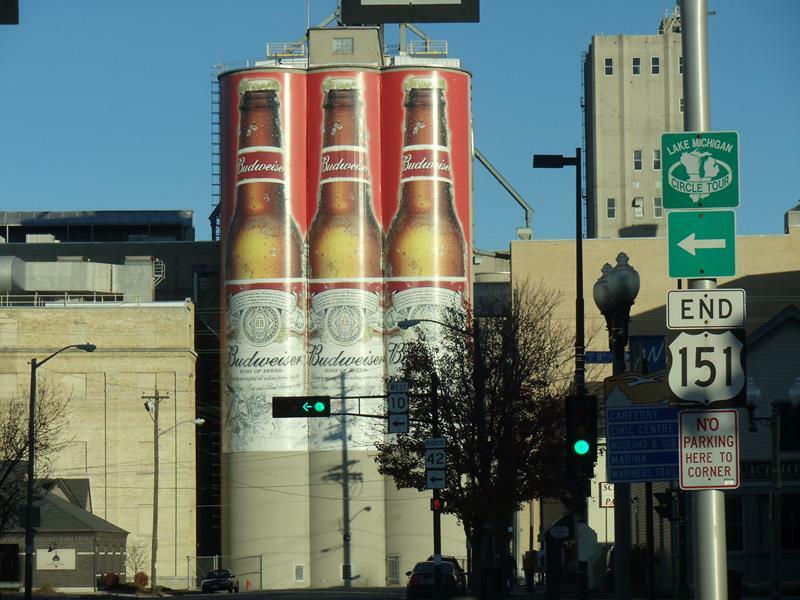 Heading along Business 42 & U.S. 151 into downtown Manitowoc you’ll come across the huge Bud bottles, a mural that has in some form dominated the end of U.S. 151 and the big turn north for Highway (now Business) 42 for over a half a century. They’re there for a reason: this was a malting plant for Anheuser-Busch for decades. Today it’s owned by Chilton-based Briess Malt & Ingredients, North America’s leading supplier of specialty malts to the brewing industry. 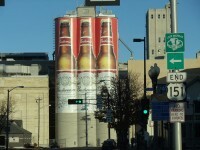 Budweiser bottles and cans, in different variations, have dominated the drive downtown along Highway 42/U.S. 151 for over fifty years. A vinyl mural replaced the original bottle design for a while, as seen at left; the original, older, cooler looking view was restored in 2014. 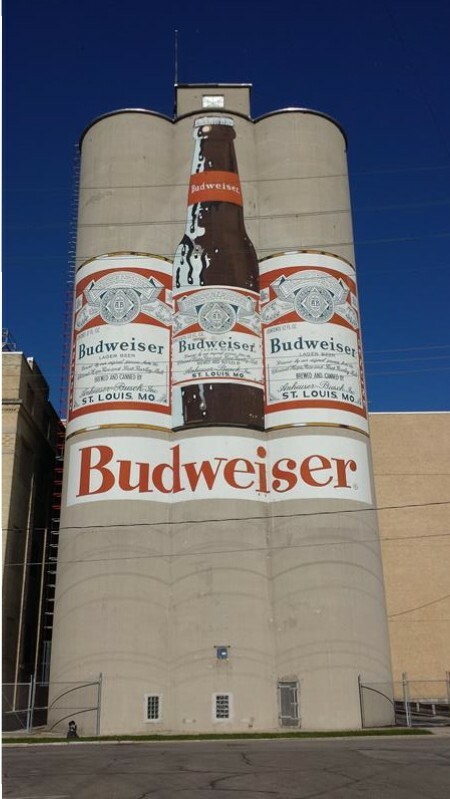 The silos are part of a massive malting facility – its origins date back to 1847! 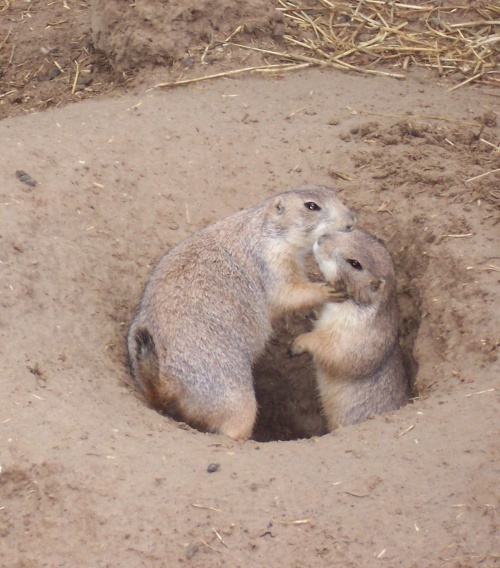 Prairie dogs showing affection – or something like that – at Manitowoc’s Lincoln Park Zoo. Further up 8th Street on the other side of Highway 42/Waldo Blvd is the Lincoln Park Zoo (920-683-4537), rife with a variety of animals amidst a beautiful park setting. Over 200 animals are here, including black bears, snow leopards, eagles, and even little prairie dogs – although they may just have wandered in. The zoo is free but if you want to make a donation I’m pretty sure they’ll accept. 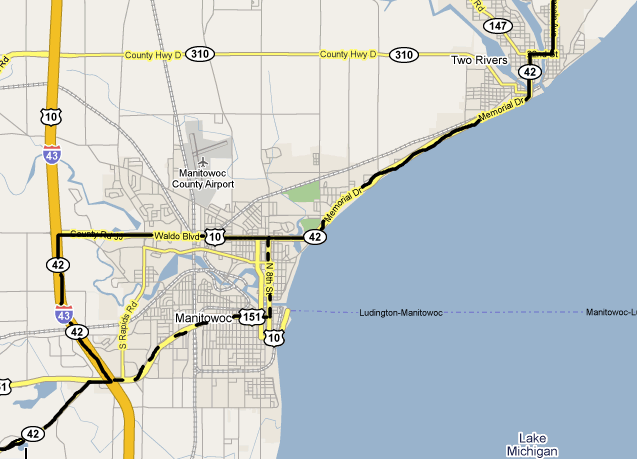 Upon reaching Lake Michigan, Waldo Boulevard carries Highway 42 along a stretch along the lakefront from Manitowoc to Two Rivers. Running within a few hundred feet of the water, a brilliant summer day makes for a beautiful ride along Lake Michigan. The Budweiser silos, perhaps the tallest signature buildings in downtown Manitowoc, are clearly visible down the shoreline, and don’t be surprised to see the SS Badger steaming its way across the lake for the 45-mile ride to Michigan. There’s also a nice walking and biking trail next to the road, right along the shoreline. 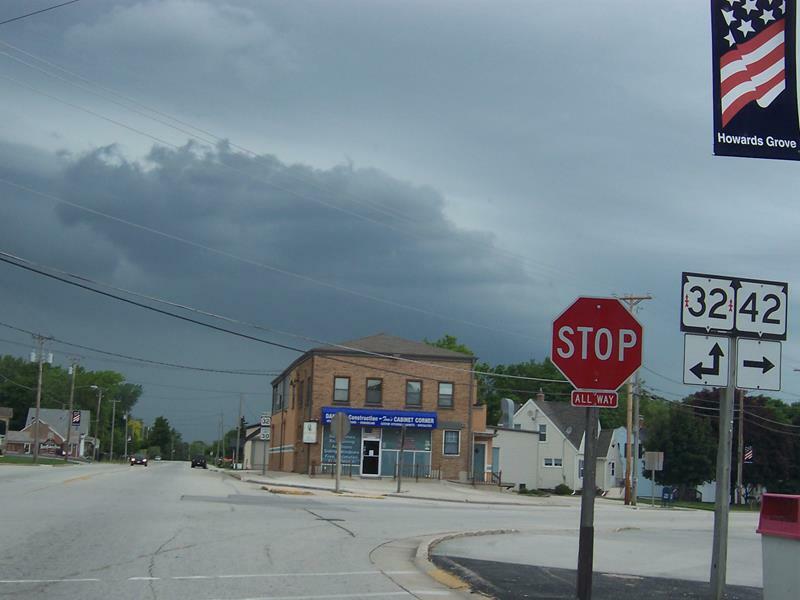 About five miles northeast of Manitowoc lies its sister city, Two Rivers (pop. 12,639), known locally as “Trivers”. It’s where the ice cream sundae was invented. Sure, Ithaca, New York makes the same claim, but what the heck do a bunch of New York upstaters know? 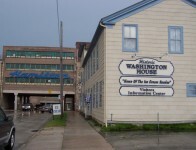 The historic Washington House (above), located one block off Highway 42 in downtown Two Rivers, where you can imbibe in a sundae just like this one at the place where they were invented. 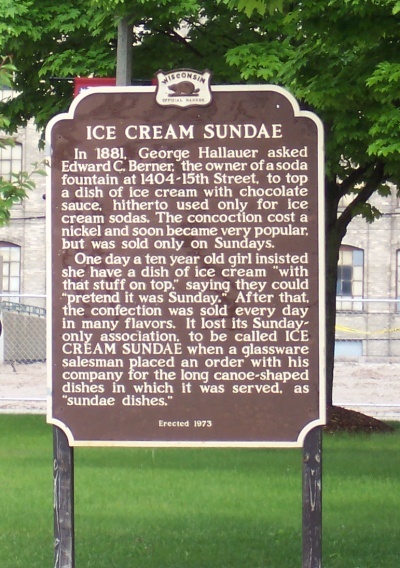 Right along Highway 42 is the marker (below) talking about George Hallauer, Edward Berner and a ten-year-old girl in search of a chocolate fix changed dessert history. 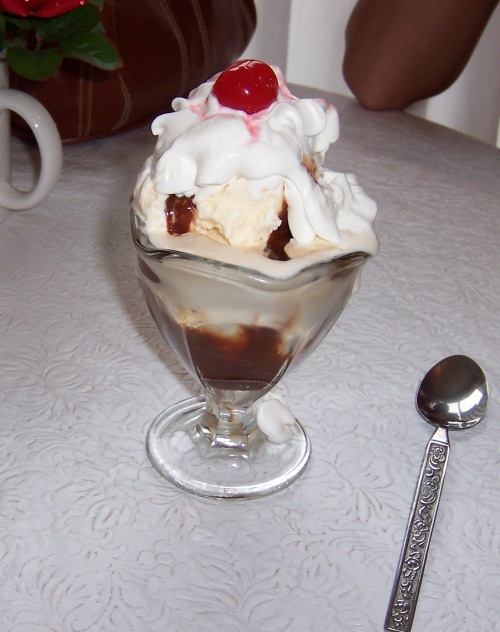 So, hop up to the historic Washington House and order a sundae. With its antique soda fountain, you’ll swear you’re in the throwback days when they only cost a nickel. But I’m sure they’ll remind you that it’s not the case anymore. The city’s official slogan is “Catch Our Friendly Waves”, which lap up on Lake Michigan and the East and West Twin Rivers, which are the two rivers the city is named after. 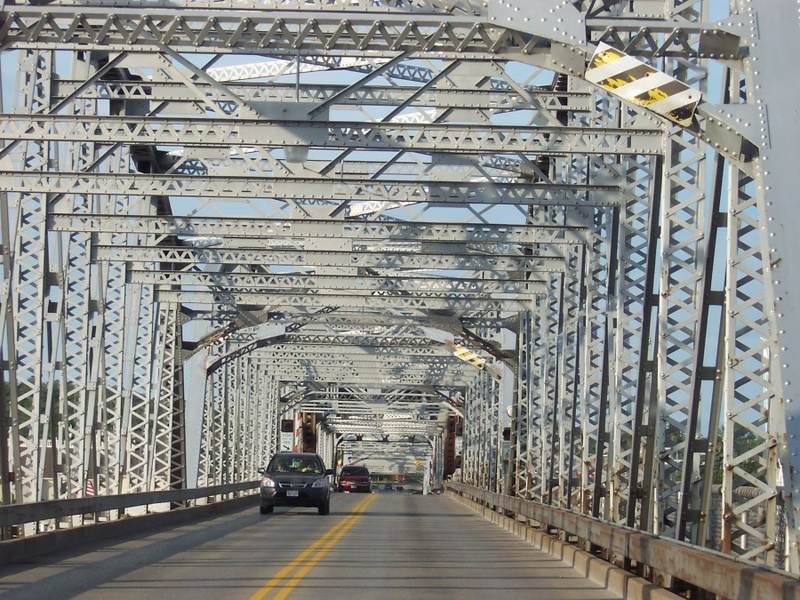 Highway 42 bridges both in the downtown area and also offers access to the Point Beach State Forest, where you can hike or bike through the woods and dunes on your way to the Rawley Point Lighthouse. 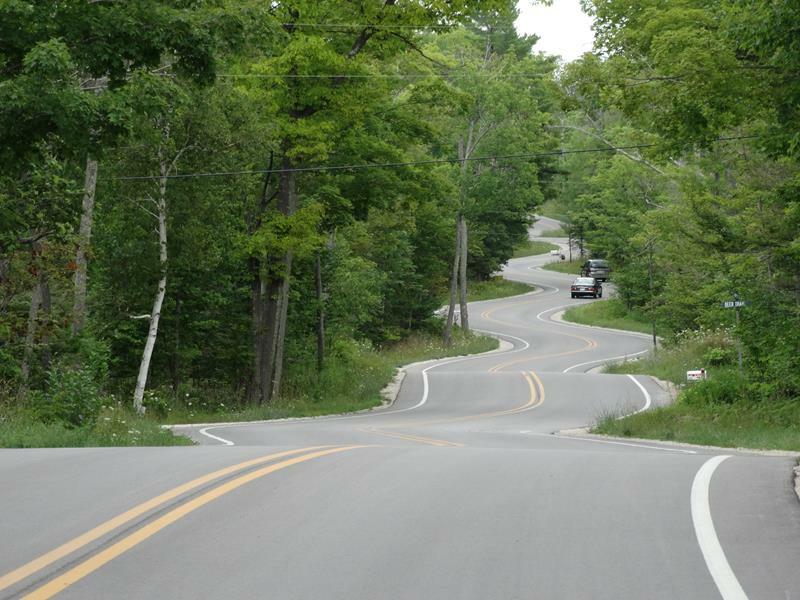 County Highway O also offers a drive along the forest’s boundary and will link you back up to Highway 42 and County V about five miles north of Two Rivers. The two rivers in Two Rivers are the East Twin and West Twin (yeah, we know, why isn’t it called “Twin Rivers”? ), which merge right before landing in Lake Michigan. Fishing has long been a staple of life here, evidenced by the Historic Rogers Street Fishing Village (2010 Rogers Street, 920-793-5905), located right along the East Twin River. Calling commercial fishing “America’s most dangerous profession”, the Rogers Street Fishing Village shows the history of Two Rivers and its fishing industry, boats and shipwrecks while offering a climb up the North Pier Lighthouse, built in 1886. 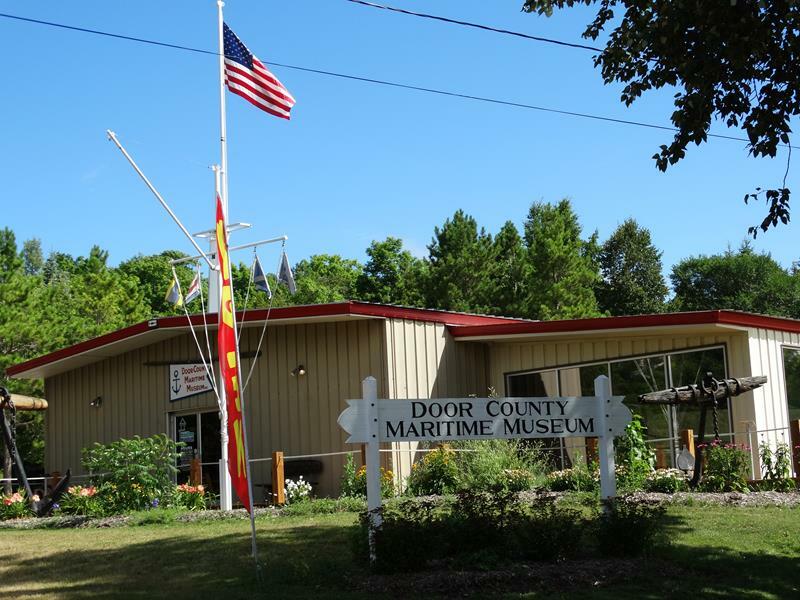 Two Rivers is recognized as having the longest commercial fishing history of any city on the Great Lakes, dating back over 170 years. Highway 42 itself makes a beeline north out of Two Rivers, past the Point Beach Nuclear Power Plant (clearly visible from the highway) and providing access to the Point Beach Energy Center (6600 Nuclear Road, 920-755-6400), which features displays and information about the history of electrical generation and how electricity is generated today – including nuclear, fossil fuels, and renewable, all big topics in our world today. Highway 42 continues north into Kewaunee County, where you pass the Kewaunee Nuclear Power Plant before heading into the plant’s – and county’s – namesake town. North of Two Rivers, the bigger towns get fewer and further between for a while. 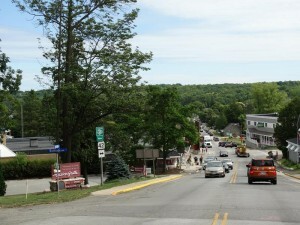 Kewaunee (pop. 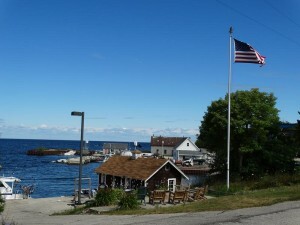 2,806), like many towns along this stretch of Lake Michigan, features a beautiful lakefront area. 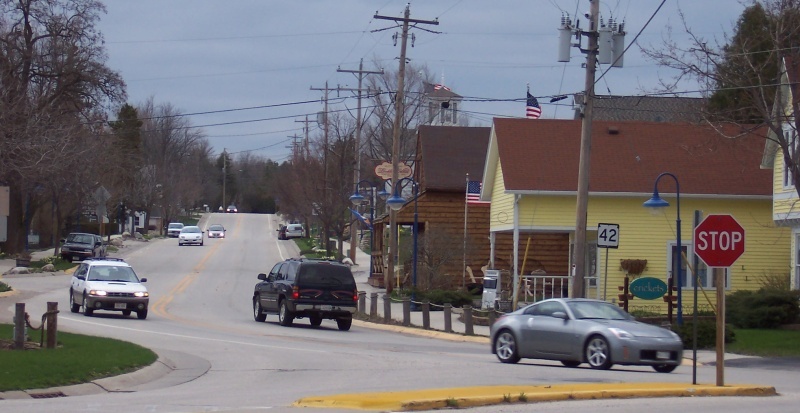 With an attractive harbor, Kewaunee was a popular Native American settlement for centuries; the French followed suit in 1634, when Jean Nicolet landed here. In 1674, Father Marquette celebrated a Holy Sacrifice of Mass here. But it wouldn’t be until 1836 when permanent European settlement took place – largely on rumors of a “gold rush” led speculators to believe Kewaunee could become a Chicago-esque, booming city someday. They laid out wide avenues and bought up lots in preparation, but things ended up falling a little short. No matter. The city thrived as a lumber town and trading center, finally becoming a city in 1893. A nice view comes as you descend a steep hill into the downtown area, where you cross Highway 29, which ends here after a long trek across the state from Prescott, on the Mississippi River. 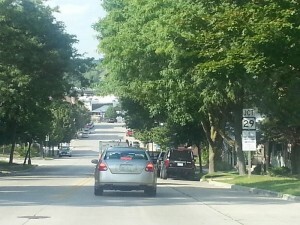 Highway 42 descends big hills from either direction to approach downtown Kewaunee, which is more level with Lake Michigan. At the bottom, Highway 29 marks the main crossroad. 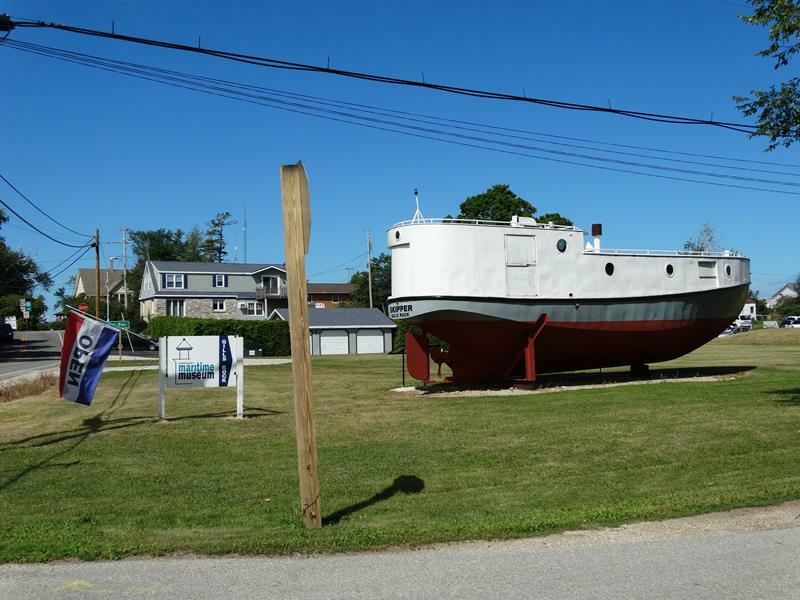 Attractions include the Tug Ludington, a U.S. Army tug built in 1943. 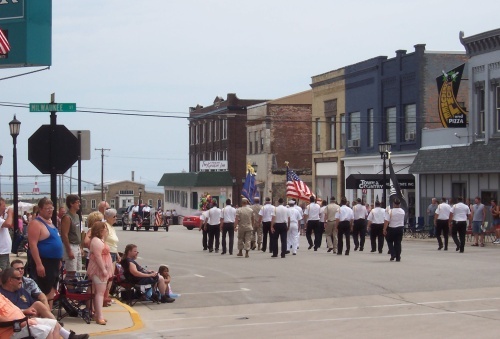 Made to help with World War II efforts, the tug participated in the D-Day invasion of Normandy and assisted with harbor operations in France and Virginia before being transferred to Kewaunee in 1947 where it lives a much calmer life. 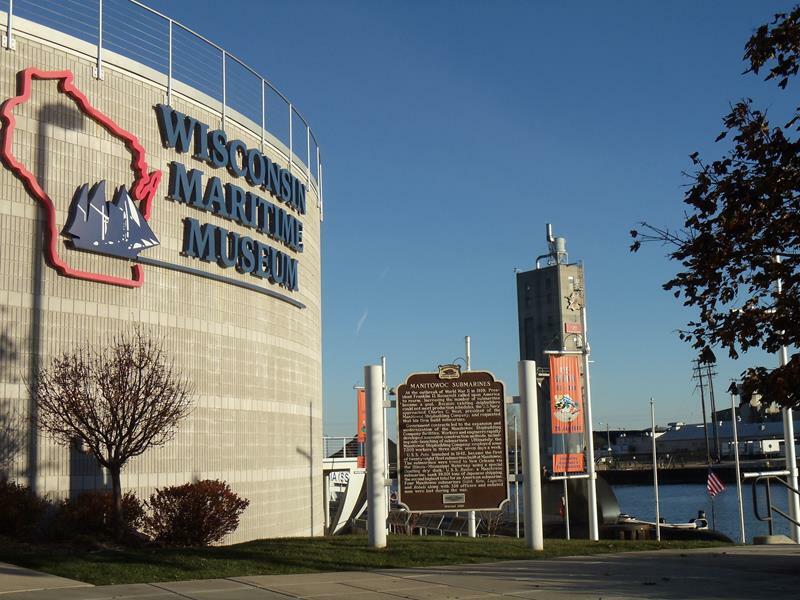 It rests in Harbor Park in downtown Kewaunee and is available for tours. The World’s Tallest Grandfather Clock helps mark the start of the Ahnapee State Trail. 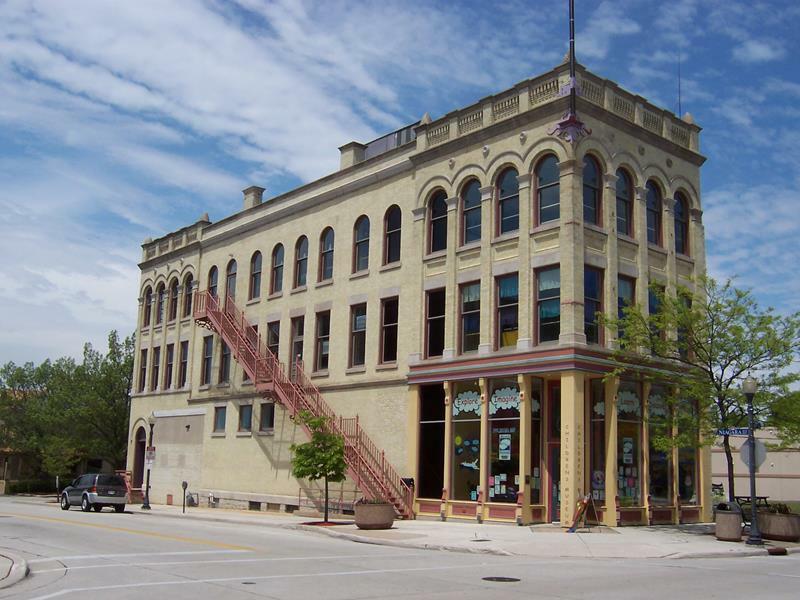 Kewaunee Historical Jail Museum (613 Dodge Street), is an 1876 structure featuring a six-celled jail, the sheriff’s living quarters and a lot of the original materials and arrangements to show you what incarceration was like for the outlaws of the day. Also downtown, watch for the World’s Tallest Grandfather Clock, which was up the hill previously but reassembled downtown in 2015. It’s so new we have to get a new picture of it! 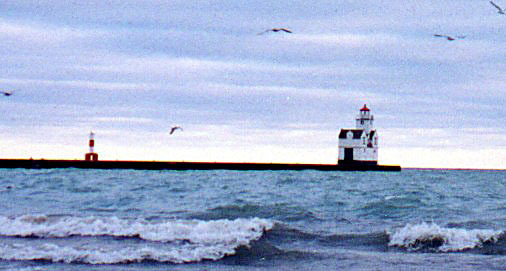 The Kewaunee Pierhead Lighthouse has been looking over Kewaunee’s Lake Michigan harbor since 1931. It makes use of a Fresnel lens, using some of the original materials from the first lighthouse built here in 1891. Picture source: Wikipedia, user Jjegers, here. From the “You’ll Never Know What You’ll Stumble Across” Department: spotted two blocks west of Highway 42 in Kewaunee. Kewaunee Trout Fest parade-watchers await the show at the end of Highway 29, at the corner with Highway 42. A classic gas station sits on the corner, which is now a Mobil. 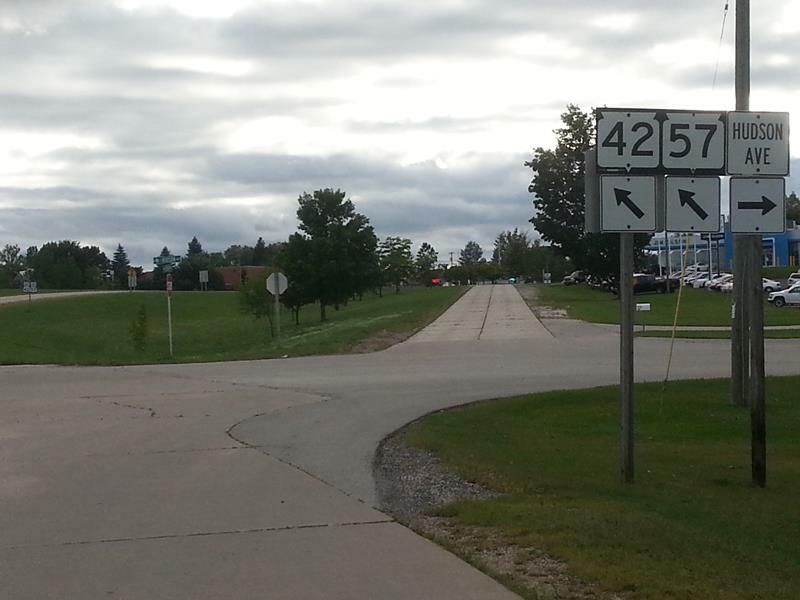 …and after the parade crosses Highway 42, they marched on toward the Lake Michigan shore, visible in the background. You know you’re getting further up north when you see a sign welcoming you to Alaska. In this case, it’s an unincorporated community noted on the highway for two lakes, a golf course, a supper club, and two sharp turns. 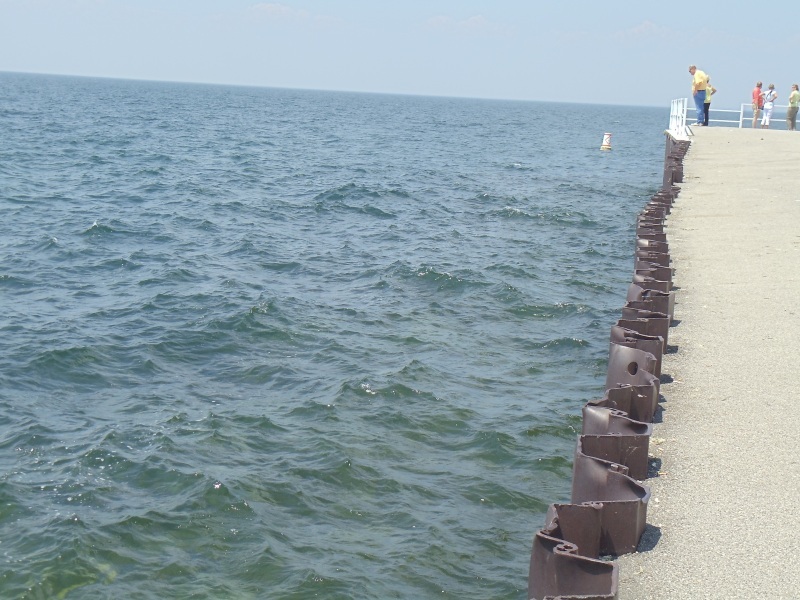 From Alaska on north to Algoma, you’re hugging the lake shore. Next door you’ll find the Ahnapee Brewery, named for the river that runs through town – in fact, “Ahanpee” was Algoma’s original name. 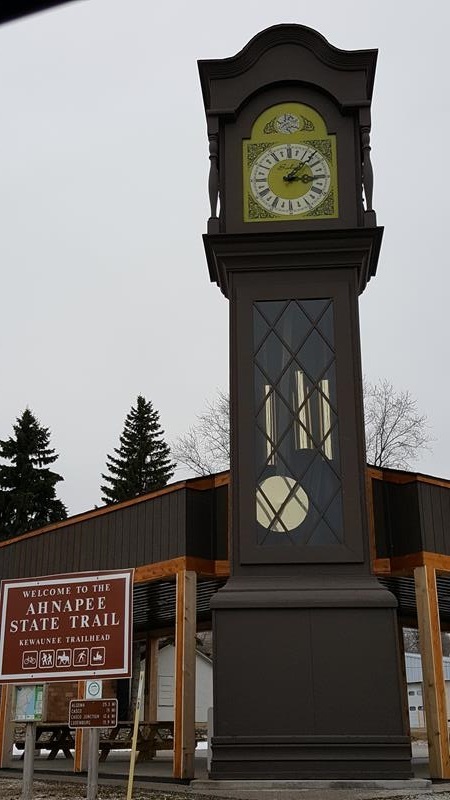 Ahnapee was a brewery in town from 1868 to 1886, and it was resurrected in 2013 with a brewery just outside of town that supplies in their in-town tap room with fresh craft beer. They’re open Wednesday-Sunday, always opening at noon while closing at 9pm Wednesday and Thursday, 10pm on Friday and Saturday, and 5pm on Sunday. You’ll find Von Stiehl Winery and Ahnapee Brewery’s Tap Room along County S in downtown Algoma, just east of Highway 42. Along Highway 42 in Algoma, you’ll find this beach along Lake Michigan. We found it on a slightly foggy morning. 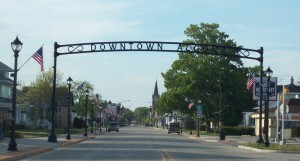 Highway 42 continues into downtown Algoma, clearly delineated by an archway. 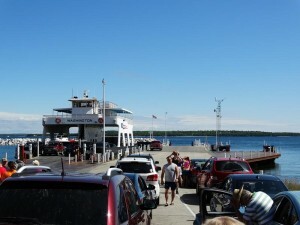 At this point, travelers to Door County can use Highway 42 or County S, which runs through Algoma’s northeast side and serves as a “short cut” to Sturgeon Bay. If you follow Highway 42, you’ll go through downtown Algoma and then head along the Ahnapee River (they changed the name of the town, but not the name of the river) for several miles to Forestville. 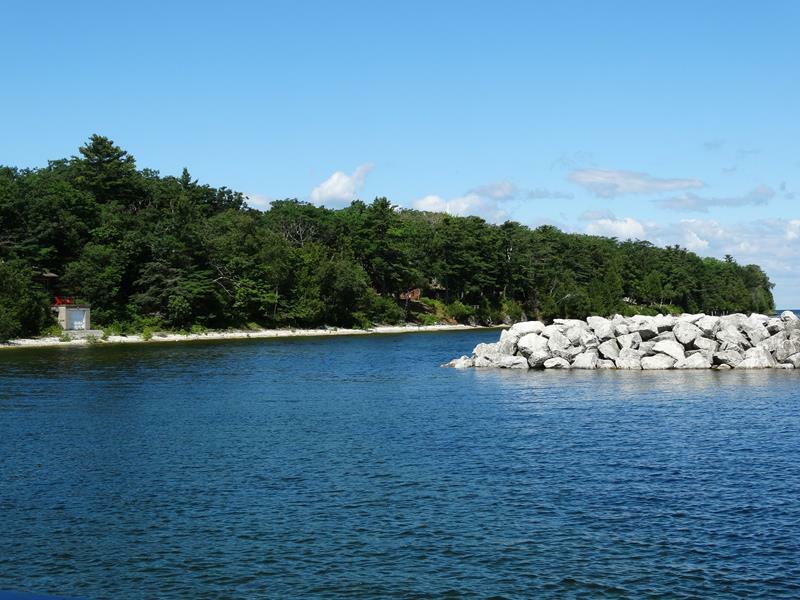 Door County is divided into south and north regions; it used to be a full peninsula, but the 1882 completion of the Sturgeon Bay Ship Canal made northern Door essentially an island. French explorer Jean Nicolet, who now has a national forest, a brand of bottled water and a high school in suburban Milwaukee named after him, landed on Door County in 1634. 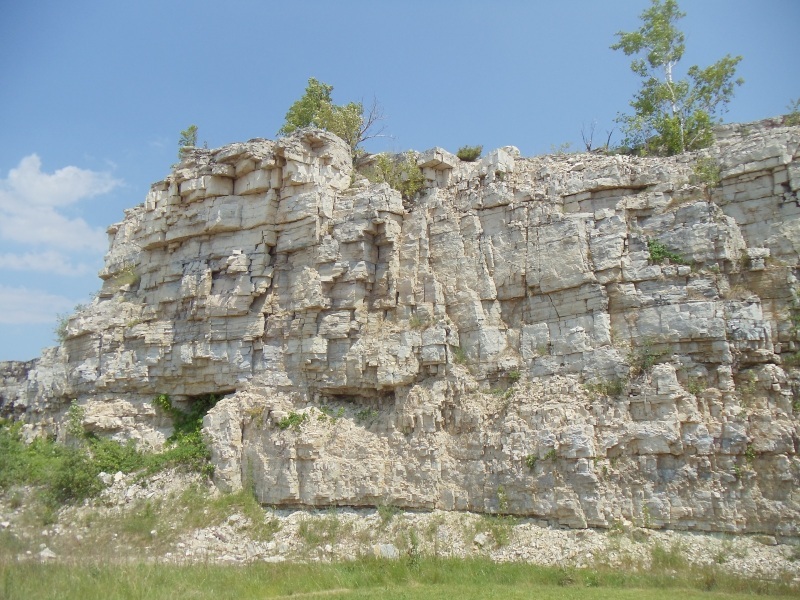 According to Wisconsin lore, he was searching for a route to the Far East – as most explorers on the Great Lakes were in those days, though they refused to ask for directions – and happened upon Ho-Chunk Indians. Thinking they were Asian, he celebrated. He was teased quite a bit after that. 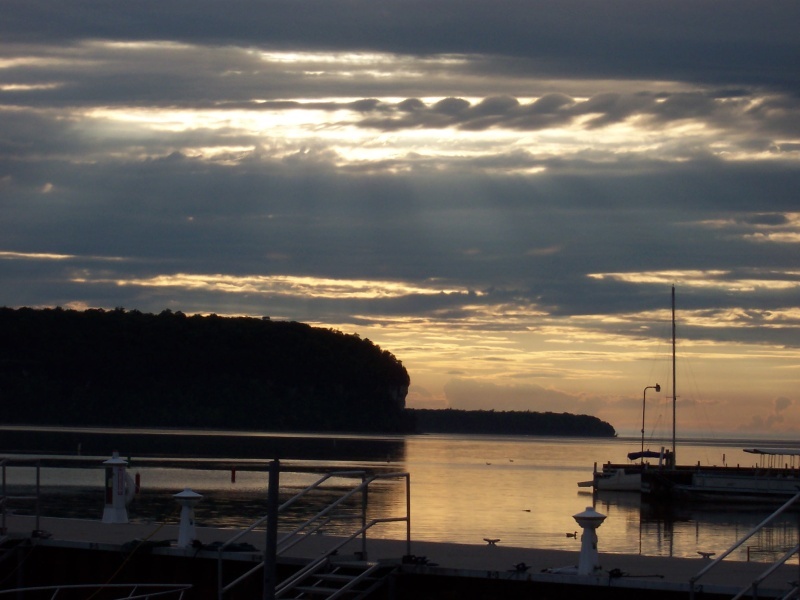 The county itself is named after the passage between the peninsula’s tip and Washington Island, known then in French as Porte des Morts and more commonly to this day as “Death’s Door” (“Door County” sounded better than “Death’s County”, right?) 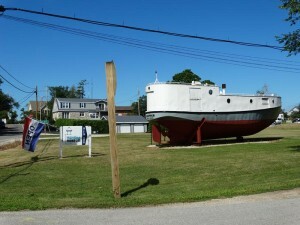 The passage is the site of many shipwrecks over the years, and Highway 42 ends right at that passage, about 50 miles from the highway’s junction with Highway 57 just southwest of Sturgeon Bay. Once hooked up with Highway 57, it’s a four-lane ride for several miles. You reach County S, which comes in from Algoma as an occasional shortcut mentioned before, and a connection to the northern trailhead of the Ahnapee State Trail, a rail-to-trail biking and snowmobiling route that runs back towards Algoma. A stone’s throw from the intersection with County S is where 42 and 57 split – you can take the bypass, a two-lane express route that winds around Sturgeon Bay, or follow the “Business District” exit, which is the former route of 42/57 and is still marked today as the “Business” route. If you’re not pressed for time, take the route through town. In the picture at left, that means following the “Business District” exit. 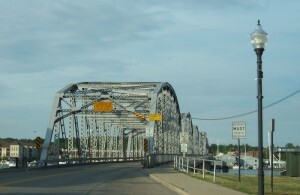 Entering Sturgeon Bay (pop. 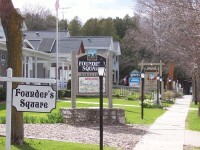 9,437), you’re in the first of many tourism-heavy towns in Door County. Strugeon Bay is the county seat and the final place on the peninsula where chain stores exist, so if you need something at Target or Wal-Mart, better stock up. 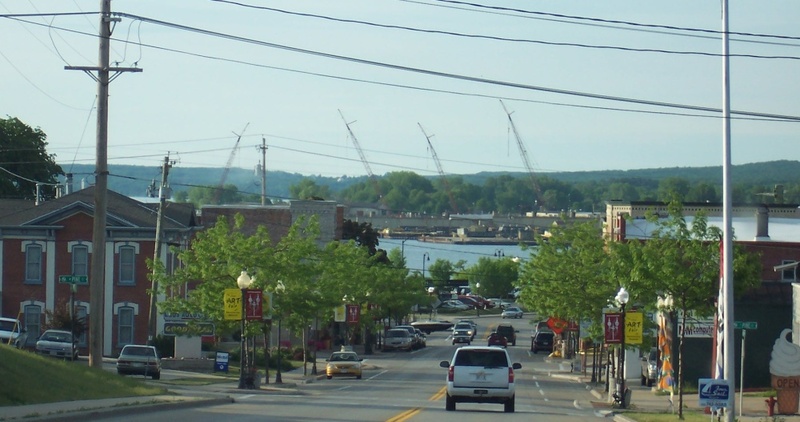 Sturgeon Bay has a history of massive shipbuilding and serves as a regional port city. Shipyard tours are available near the many cranes that abound to the north during the Ship Canal crossing. 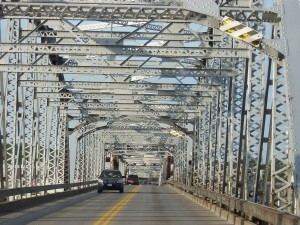 The original bridge downtown, officially called the Michigan Street Bridge and referred to by most as the “Steel Bridge”, opened in 1930 as the original path of Highways 42 & 57. Before the bypass opened in 1977, it was the source of massive traffic jams when the bridge opened to let boats pass. 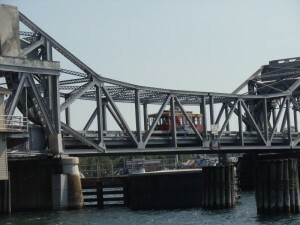 During a multi-year closure of the Steel Bridge, the Oregon Street Bridge opened a block south in 2008 and now serves as a modern downtown crossing as Business 42 & 57. The view of and from the bridge is quite nice, though, and a series of restaurants, hotels, resorts and shops surround the streets on either side. 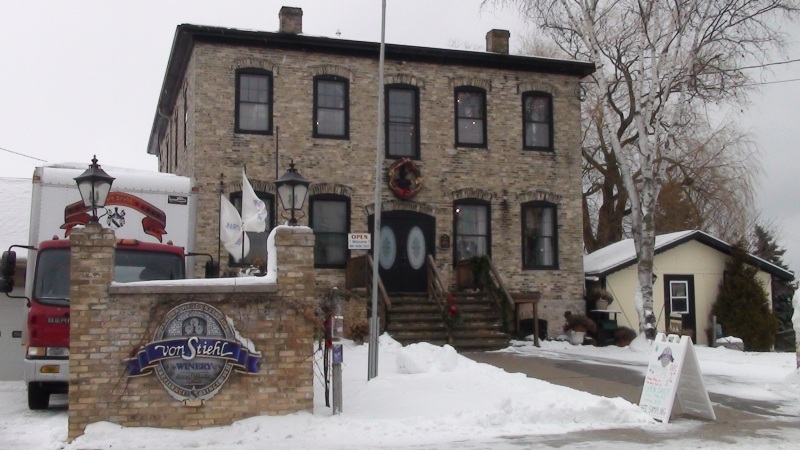 A number of bed and breakfasts in town also makes Sturgeon Bay a popular overnight stop for Door County travelers. Including today’s bypass that serves as the mainline Highways 42 and 57, there are now a total of three crossings between northern and southern Door County. 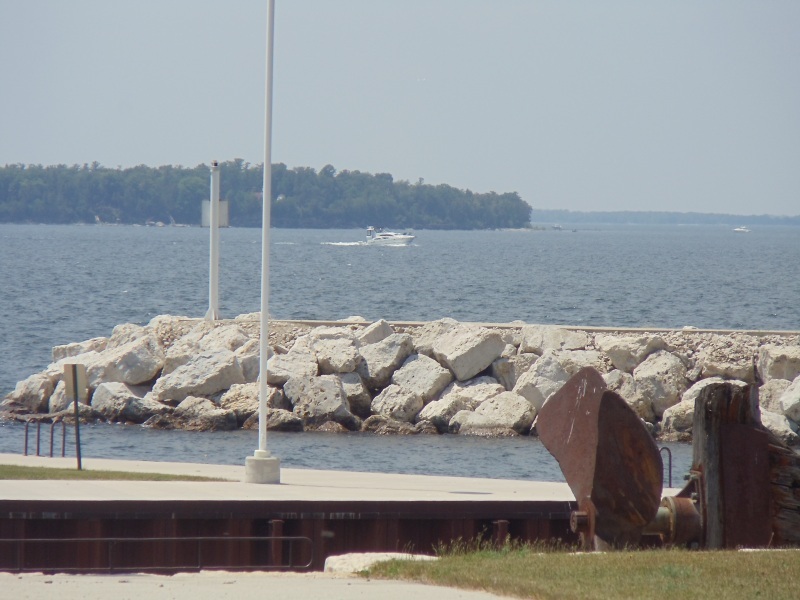 Attractive views abound in Sturgeon Bay approaching the shipping canal, which cuts the Door peninsula in half. A series of cranes to the north serves as evidence of the city’s continuing shipbuilding industry. 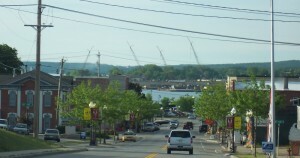 Once the only connection to the northern Door peninsula, Sturgeon Bay’s downtown bridge is flanked by a new bridge just south on Oregon Street, which currently serves as the main downtown crossing. The mainline 42/57 follow the bypass built in 1977, which crosses about a mile to the southeast. Travelers on this bridge often hummed the opening theme to “Taxi” as they headed across this thing. 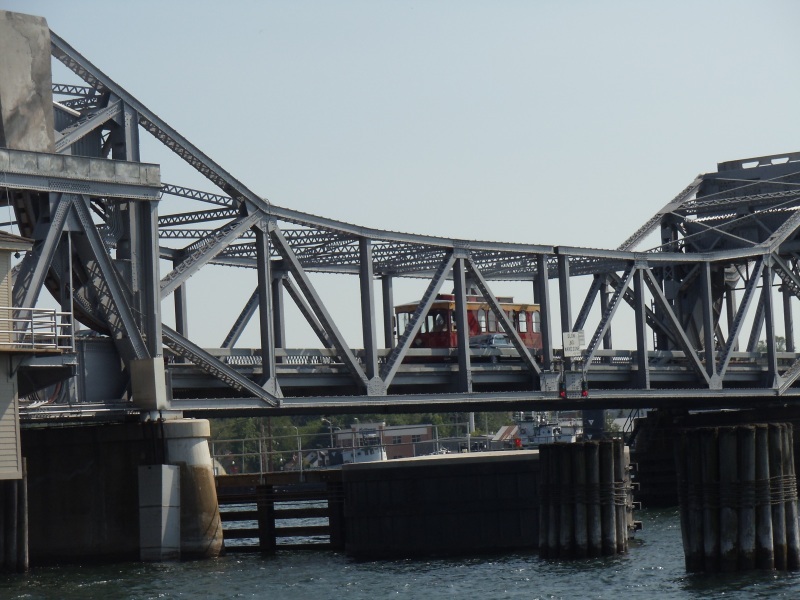 Yes, you can catch a rubber-tired trolley in Sturgeon Bay sometimes – and it’s fun to ride it across the steel bridge. 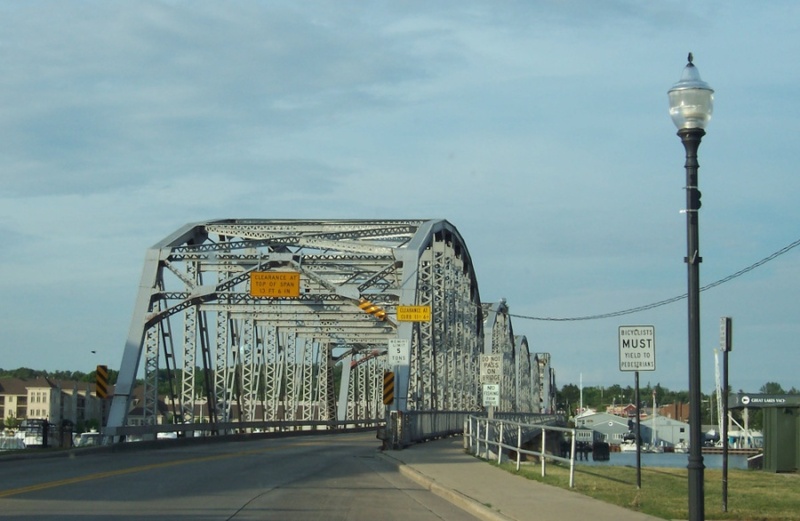 The eastern shore – technically “upper Door” – is where the main part of Sturgeon Bay lies. 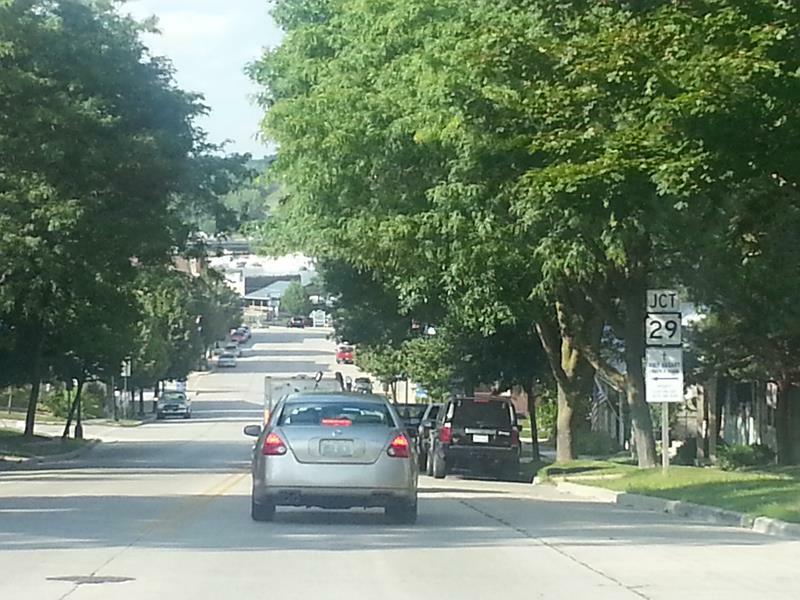 Across the canal, Business 42 & 57 cut right through downtown Sturgeon Bay. 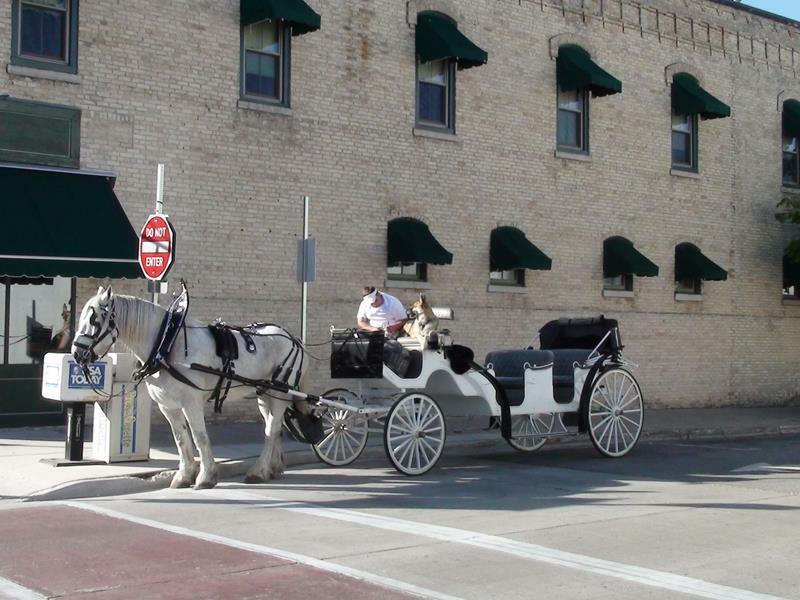 Sturgeon Bay has a healthy main street and even offers activities like carriage rides. 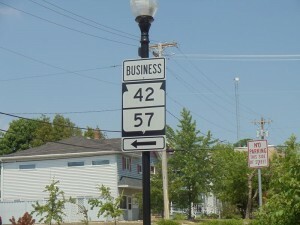 On the north side of Sturgeon Bay, “Business” 42/57 – the original road – is called Egg Harbor Road. This is the bypass around Sturgeon Bay where 42 & 57 officially go now. It’s faster. but boringer. If that’s a word. On the north side of the bypass as 42 & 57 begin at their turn, a remnant of the old road shoots straight ahead towards downtown Sturgeon Bay. The realigned Egg Harbor Road is just ahead and realigns with this segment a few hundred yards down. A cool place to check out is Olde Stone Quarry County Park (also now called George K. Pinney County Park) accessible via County B from 42/57 just north of Sturgeon Bay. 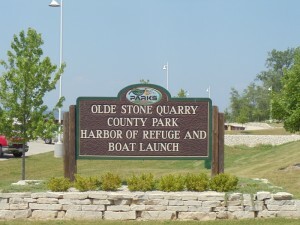 Once a quarry (no doy), this land was redeveloped to offer a harbor, boat launch, ship artifacts, and beautiful views of both rock walls and the shoreline. The “Business” and mainline routes of Highways 42 and 57 reunite north of Sturgeon Bay and stay together for about two miles before Highway 57 breaks east. 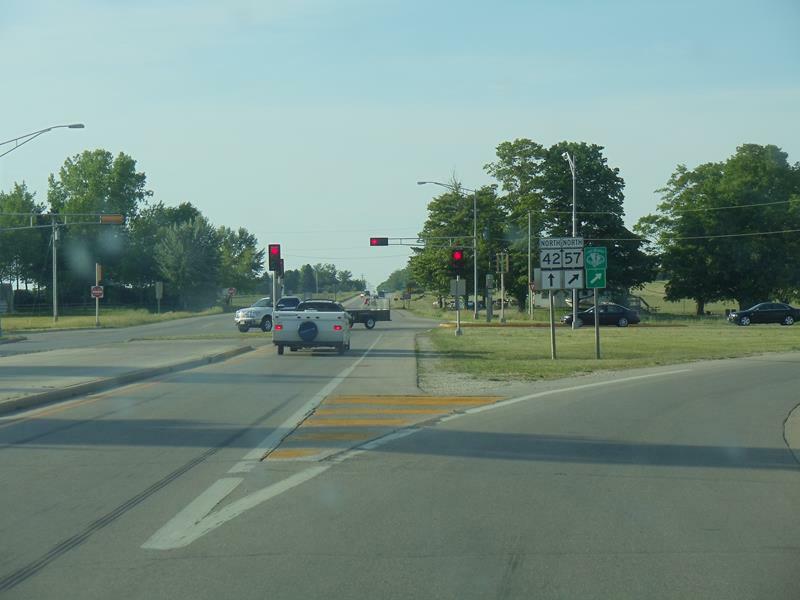 This is the northernmost traffic light in Door County – with about 40 miles of peninsula left! 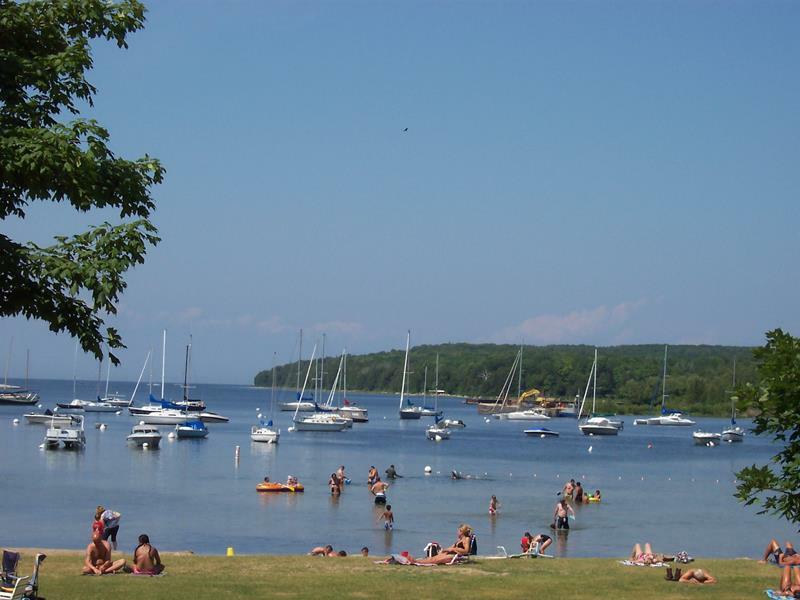 Highway 42 basically follows the Green Bay bay side of the peninsula while Highway 57 heads for the more dune-filled and serene Lake Michigan side, including Jacksonport, Whitefish Dunes State Park and Bailey’s Harbor. Since this is the Highway 42 tour, we’ll follow the Bay side. It’s the busier and more touristy side of the two, and don’t be surprised if you spot a ton of Illinois license plates – as well as more than a few Minnesota and Iowa as well as a bunch of other states – along the way. Where 57 splits away from 42. Say bye-bye to traffic lights the rest of the way! Heading north of Highway 42, you make a beeline for Carlsville and the well-known Door Peninsula Winery. Known far and wide for fruit wines, they’ve won plenty of awards for their Sweet Cherry, their Razzle Dazzle Raspberry and the State Trunk Tour recommendation, the Sunset Splash ($8.99/bottle). The tasting room is open 9am-6pm daily, where you can belly up and get free tastes of their huge variety of wines. You can also take a tour for $3; those are available on the hour from 10am-4pm. 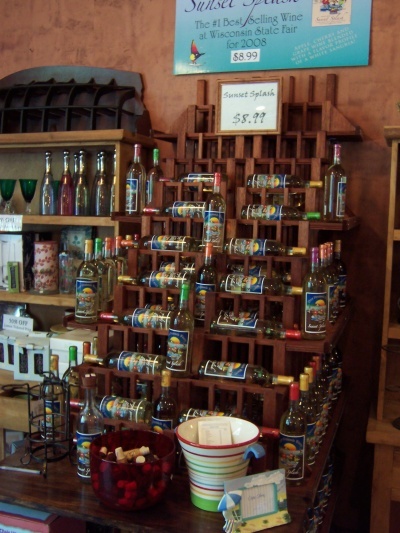 In 2011, they added the Door County Distillery, where you can try and buy a variety of gins and vodkas – including a cherry vodka – and more recently whiskey. Back to the road, Highway 42 abuts the eight acres of Door Peninsula Winery’s vineyards. They have about 5,500 vines in production during the season, including cherry, apple and a variety of grapes and grape hybrids designed to handle the climate. Shortly past Carlsville, you cross a significant line: the 45th parallel, aka the halfway point between the Equator and the North Pole. A geographical marker notes the spot. 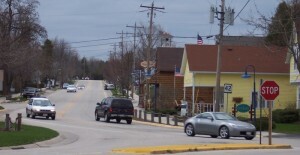 A few miles on the other side of that halfway point is the first of a string of communities lining Highway 42 along the north peninsula: Egg Harbor (pop. 250). The road skims the eastern edge, along a series of shops and Harborview Park. Egg Harbor is named not for its egg-shaped harbor but for a legendary egg fight in 1825, written about by witness Elizabeth Baird, who apparently took a few stray eggs in the noggin. Shipwrecked, the oldest of Door County’s emerging microbreweries. Shipwrecked offers these facilities, too. Run for it! 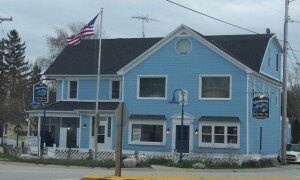 At the curve where Highway 42 gets closest to the water in Egg Harbor, you’ll find Shipwrecked Brewpub, the oldest brewpub in Door County. Housed in a saloon originally built in 1882, Shipwrecked opened in 1997 and has been treating thirsty residents and visitors ever since. Their Door County Cherry Wheat is legendary, drawing from the peninsula’s extensive cherry orchards. They also make Peninsula Porter, Summer Wheat, Lighthouse Light, an IPA, and a seasonal Pumpkin Ale, among others. Their brewpub also offers a nice selection of food after your beer selections, since one can’t eat on an empty stomach. Highway 42 curving through Egg Harbor, as viewed from Shipwrecked Brewpub. Couldn’t resist this shot of a tractor. 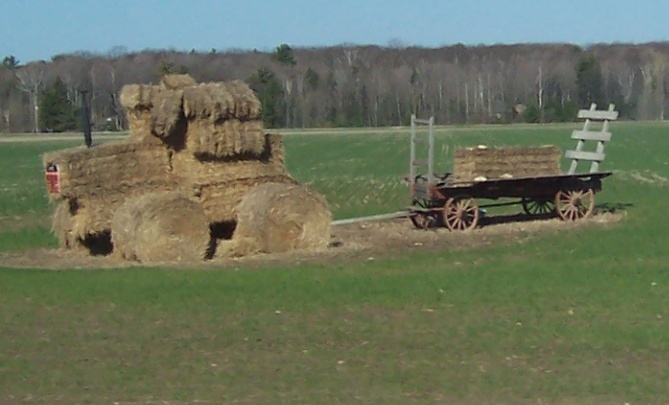 Made of straw. I don’t know what kind of mileage it gets, but I’m sure it’s relatively light. 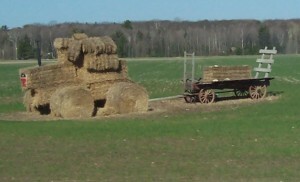 Taken along Highway 42 just south of Fish Creek. Six miles up the road, just after a twisty, turny ride down a bluff toward the water level, is Fish Creek (locally called “Fish Crick”), one of the most charming Door County hamlets. Fish Creek’s first pier was built back in 1855 and its oldest remaining home, the Alexander Noble House (repotedly haunted and available for tours, 920-868-2091), was built in 1874. Most of the gift shops came much, much later, even though tourism was starting to replace commercial fishing as the local economic engine by 1890. Over 40 structures in Fish Creek have “historic” designations; that’s one historic structure for every five residents! 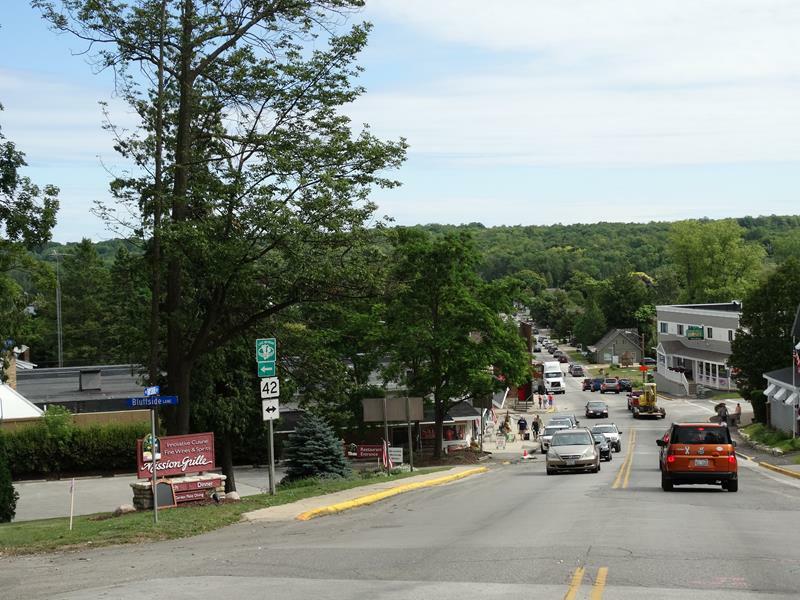 The continuing charm, the views, access to fishing and camping, and notable shops and restaurants make Fish Creek a popular stop for Door County visitors. During World War II, Fish Creek hosted a German POW camp under an affiliation with Fort Sheridan in Illinois, about 250 miles down the Lake Michigan shore. The prisoners cut wood, engaged in construction projects, and picked cherries in the area. Restaurants amd shops abound in “downtown” Fish Creek. 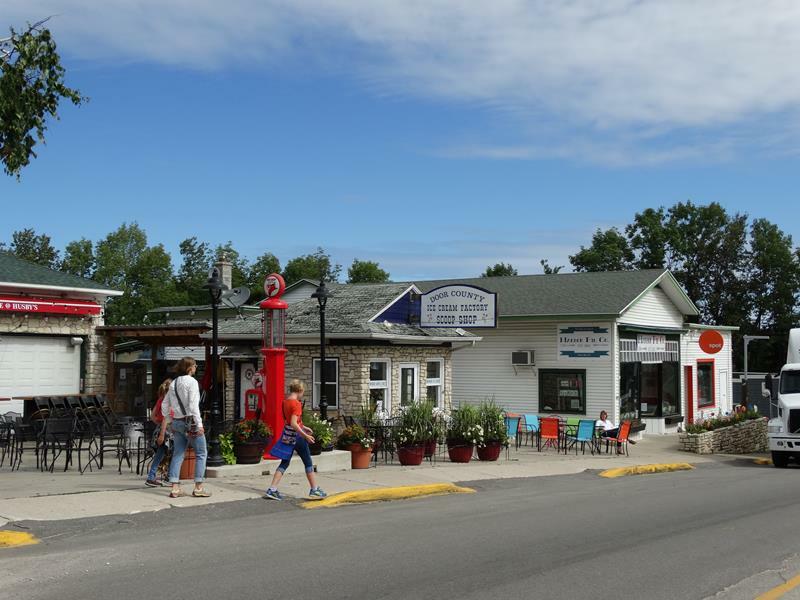 Lots of boutique shopping choices await in Fish Creek. The former C&C Supper Club, a longtime State Trunk Tour favorite, has now been transformed into a new place called Juniper’s Gin Joint (after a stint as “Cooper’s Corner”), which features a second level outdoor bar and restaurant and a wine cellar below. There’s also The Cookery (920-868-3634), and the historic 1910-era Summertime Restaurant (920-868-3738) on Spruce, adjacent to Highway 42. 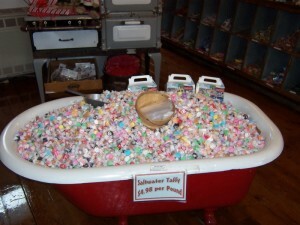 Gift shops, craft stores and boutiques also line the streets, offering up more than the standard tourist town fare. The area is, after all, a popular place for artists. A bathtub full of taffy… who’s in?? It’s not all indoor stuff – Fish Creek has a small and popular beach offering swimming, sunbathing, and beautiful views of Fish Creek’s harbor and Peninsula State Park, to the right. Speaking of art, the Peninsula Players Theatre performs a variety of Broadway-style plays and musicals in what some call the nation’s oldest summer theater. Not to be outdone, the American Folklore Theatre also performs here, sometimes adding a zanier edge to their performances. 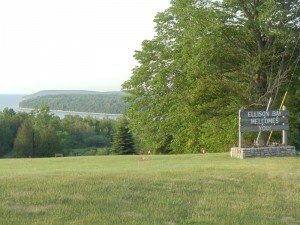 The Peninsula Music Festival takes place every August here. If sitting in your car watching a movie is more your style, yes, they have you covered there, too: the Skyway Drive-In is located right along Highway 42 and brings back that old-school feel of watching a movie and listening to the sound of a tiny speaker next to your window. 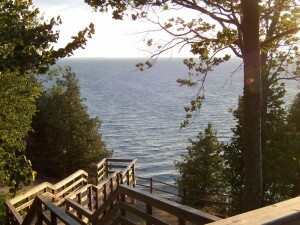 The phenomenal Peninsula State Park is the most popular in Wisconsin’s state park system, bordered by the waters of Green Bay and Highway 42 between Fish Creek and Ephraim. Covering 7 miles of shoreline, steep bluffs, abundant camping opportunities and terrific hiking and biking trails, Peninsula State Park offers 3,776 acres of adventure. Check out Eagle Bluff Lighthouse, with its 45-foot tall square tower and magnificent views; even the view from the stone wall overlooking the water at the lighthouse’s base is excellent, and a popular rest stop for bikers, hikers and cross-country skiers making their way through the park. Eagle Tower is a 75-foot high observation tower with 3 decks, perched on Eagle Bluff 180 feet above the water. 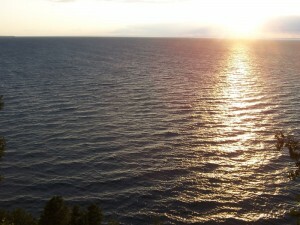 From the top, you can see all the way up the peninsula, the island chain leading to Michigan’s Upper Peninsula, and the twin cities of Menomonee, Michigan and Marinette, Wisconsin on a clear day. Unfortunately, it was closed in 2015 pending engineer’s reports and we await either its reopening if they can fix it, or hopefully its reconstruction if they can’t. As the sun drops toward the waters of Green Bay, the view of the harbor and Eagle Bluff from Ephraim can occupy you for hours. On the other side of the park is adorable little Ephraim (pop. 353), founded as a Moravian religious community in 1853. 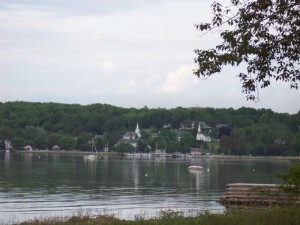 Ephraim frames the eastern shore of Eagle Harbor and is home to abundant B&B’s and small motels. 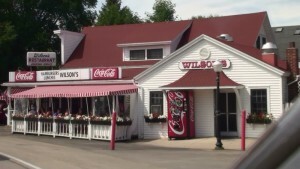 A stop at Wilson’s Restaurant & Ice Cream Parlor right along Highway 42 is a must. Ice cream sodas and other treats are the order of the day here. So are omelets and other treats, if you stop at Good Eggs (920-854-6621), right on Highway 42 at Brookside Lane, which whips up great breakfasts and – in some summer afternoons – custom sandwiches in something they call “the grilled cheese project.” Worth checking out. 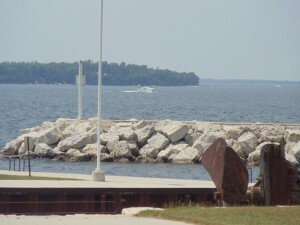 Meanwhile, the harbor view, parks and beaches across the street provide terrific views of the waters of Green Bay, Eagle Bluff and Horseshoe Island in the distance. Charging up the hills framing Ephraim will give you an even better view of it all – and will help you work off that ice cream. 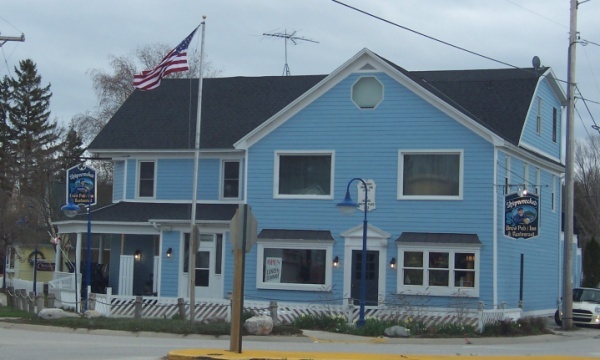 Up the hill, there are more places to check out, including the Blue Dolphin House, which features a wide variety of fine arts & crafts, furniture, decor accents, bed & bath items and even cookbooks. There are also some good resorts. 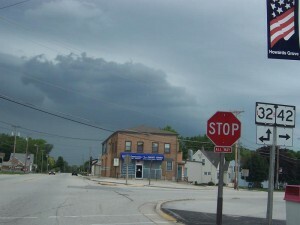 Ephraim was the only “dry” municipality in Wisconsin for decades, where the manufacture or sale of alcohol was prohibited. 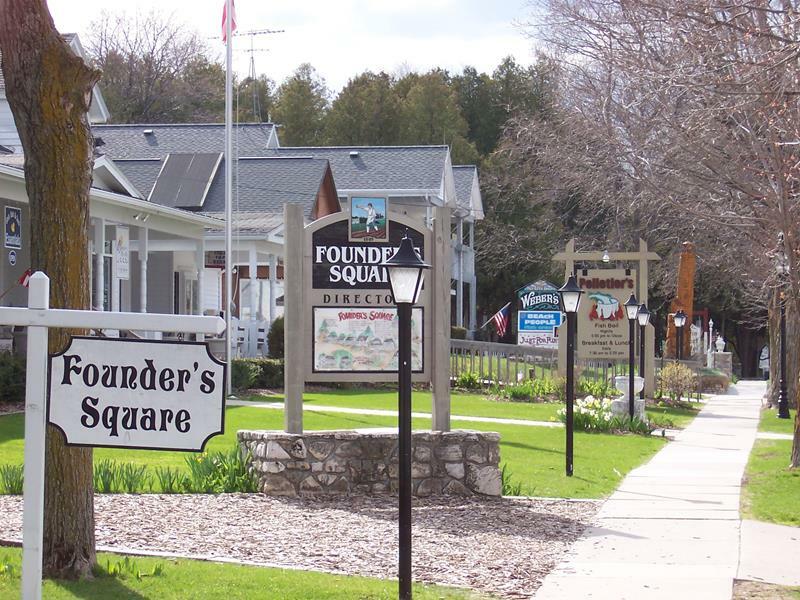 As recently as 1992, 74% of the village residents voted to keep it that way. In 2015, that all changed. Now there is no “dry” municipality in Wisconsin. A must-stop in Ephraim is Wilson’s Restaurant and Ice Cream Parlor, a staple of Door County since 1906. 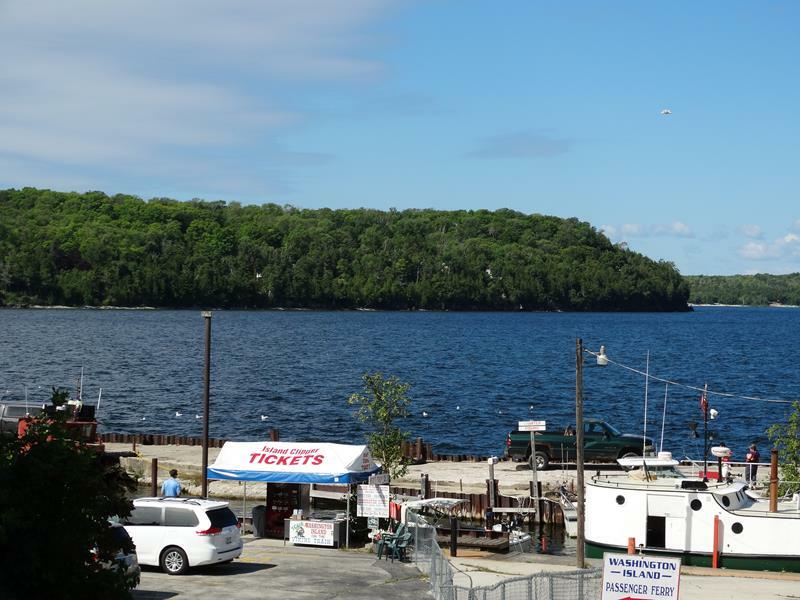 With the old fashioned soda fountain feel and a gorgeous view of the harbor and Eagle Bluff across the street, it’s a great place to grab a burger, malt and (notice I didn’t say “or”) a cone. Beyond Ephraim lies Sister Bay (pop. 886). 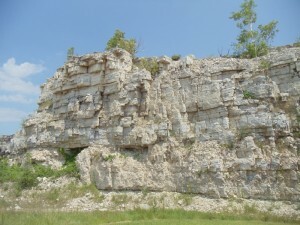 Along Highway 42 is a multitude of things to do, including Johnson’s Go-Kart Track (always a lot of fun and, ironically, a good break from driving) and Pirate’s Cover Adventure Golf. Sister Bay offers more restaurants, bars, boutiques, and lodging than any place beyond it on the peninsula, so note that! A good beer selection can be found too, at Bier Zot (10677 N. Bay Shore Drive, 920-854-5070). They have an extensive list of Belgian beers – in keeping with the area’s heritage – and other craft brews along with a gastropub menu. They’re a sister business of Wild Tomato back in Fish Creek. Here’s the intersection where Highway 57 ends at Highway 42, looking down towards the heart of Sister Bay. A “can’t miss” – and it’s hard to when goats are grazing on the grass roof – is Al Johnson’s Swedish Restaurant and Butik (800-241-9914). 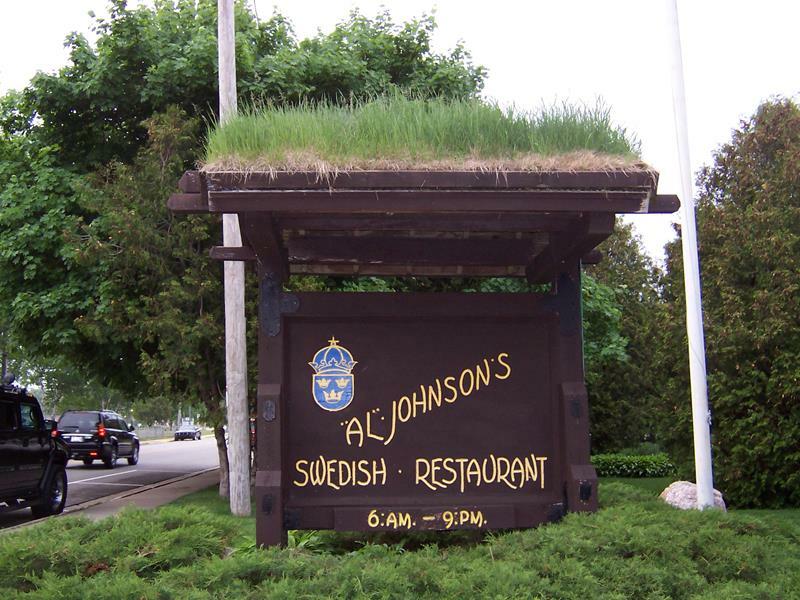 Al Johnson’s whips up a ton of great Swedish fare, including pickled herring, pytt i panna, and the ever-popular Swedish meatballs. And it’s probably the only restaurant in the country where the roof needs to be mowed. However, the job is often done by 4-6 goats that use the ramp in the back. They much away from about 8:30am to 5pm during nice weather days while guests munch inside all year ’round. 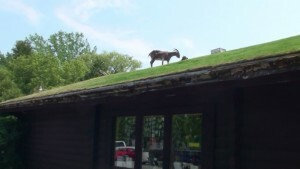 Yup, you’re seeing goats grazing on what is undoubtedly the original “green roof”, part of the charm in Sister Bay at Al Johnson’s Swedish Restaurant and Butik (that, apparently, is how they spell “boutique” in Sweden.) It’s just down Highway 42 a few blocks past the northern end of Highway 57. 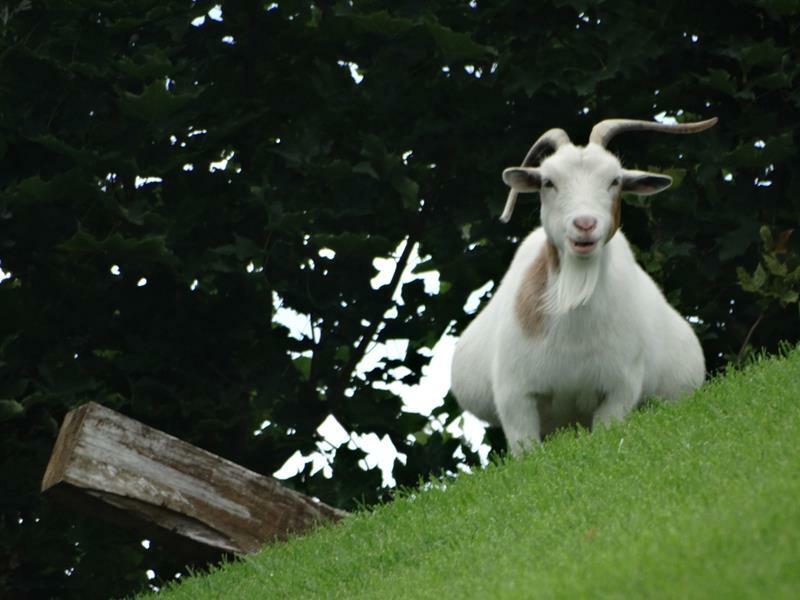 The grass doesn’t always distract the goats; a zoom lens may catch their attention. Sister Bay has plenty of shops, restaurants and a nice marina with a view of the Sister Islands not too far offshore. Walking around Sister Bay lets you explore a nice variety of places and walk along the water. HIghways 42 and 57 come back together here; and then it’s just 42 to the tip. 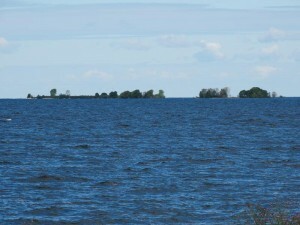 The Sister Islands as viewed from Sister Bay. Good thing the trees are there! Highway 57 arrives in Sister Bay and meets up with Highway 42 just before Al Johnson’s. From this point forward, Highway 42 is the last main road to the tip of the peninsula. Beyond Sister Bay, things get more sparse; much of the tourism development simply hasn’t reached critical mass here (yet) and you can almost feel the peninsula getting narrower as you continue. 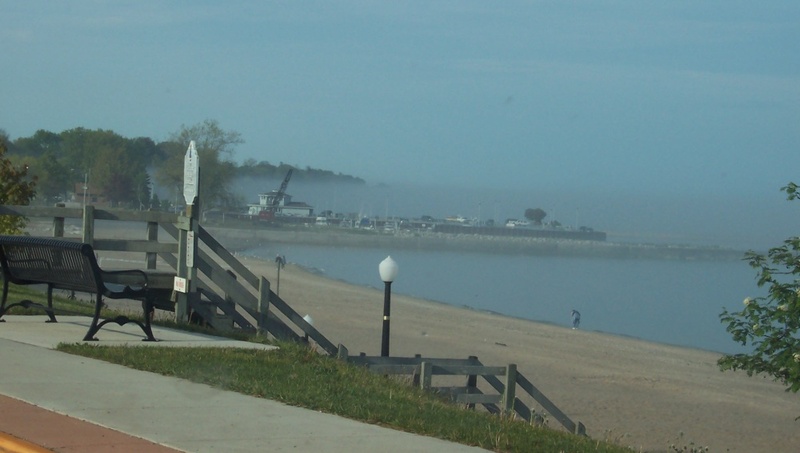 Foggy weather is much more prevalant from here to the tip; it’s not uncommon for this area to be shrouded in fog and 10 degrees cooler than Fish Creek or Sturgeon Bay. 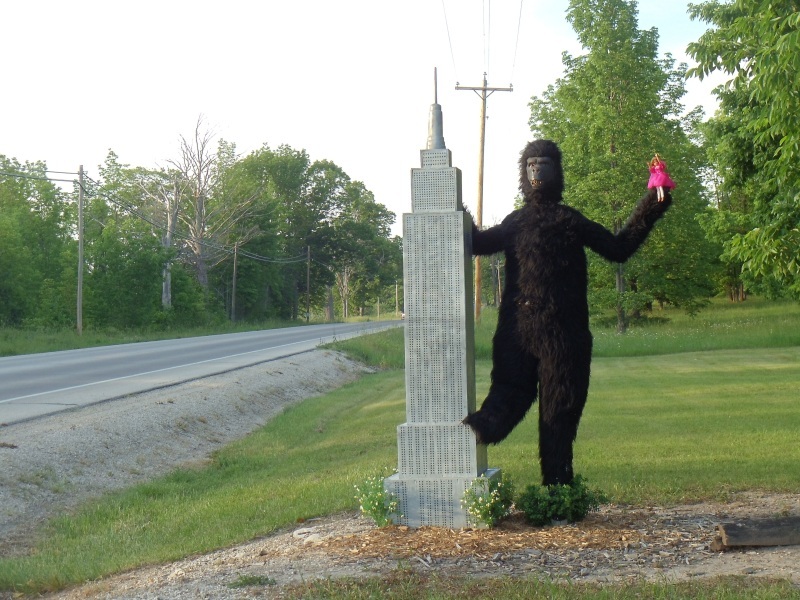 From the “You’ll Never Know What You’ll Find on the State Trunk Tour” Department: King Kong clutches the Empire State Building in one hand and a modern doll posing as Fay Wray along Highway 42 near Ellison Bay… for whatever reason. 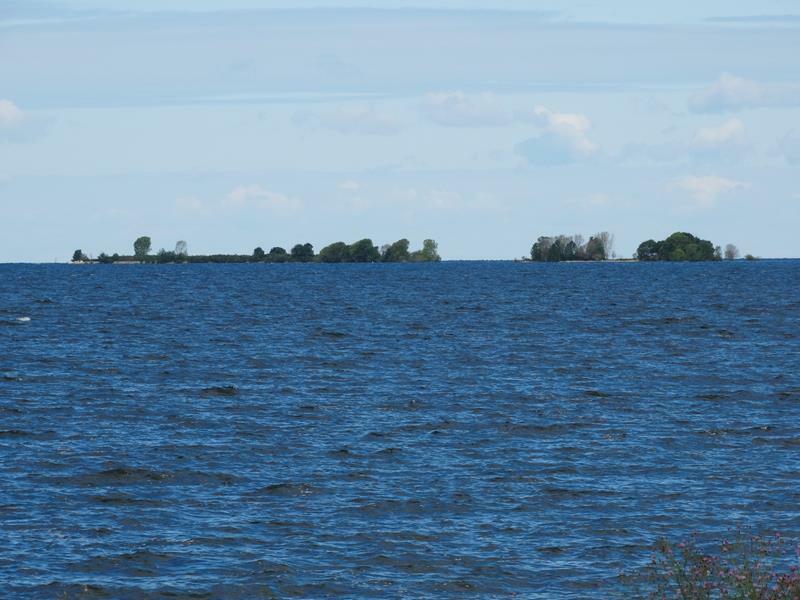 As you get into Ellison Bay heading north, two lobes of land are visible: the first out there is where Gills Rock and the tip of the Door Peninsula sits; the one behind it is Washington Island. 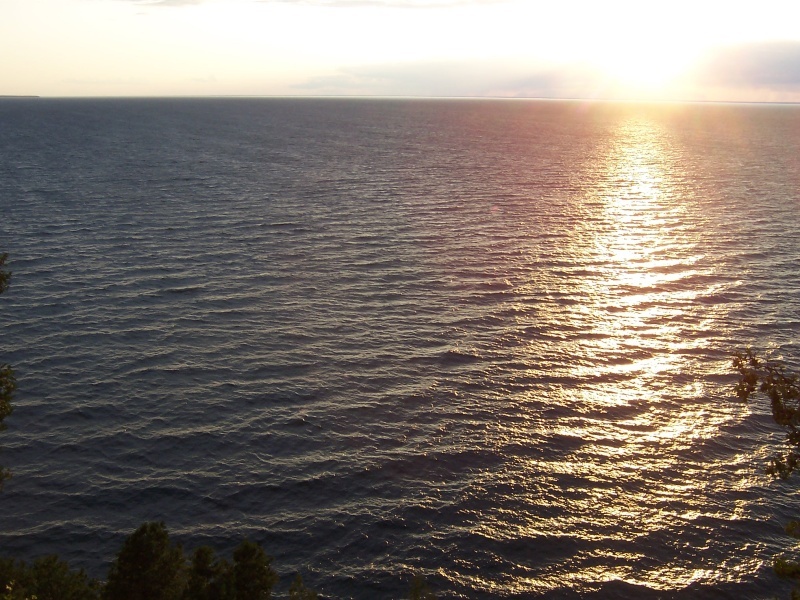 For an incredible view, head west on Porcupine Bay Road and then north on Ellison Bay Road. It leads you to the Ellison Bluff State Natural Area, which provides an overlook of the Green Bay waters that can be worth the drive to Door County alone! Just past Ellison Bay, Highway 42 cuts into the center of what’s left of the peninsula; Europe Bay Road will lead you to Newport State Park, which hugs the peninsula’s edge. 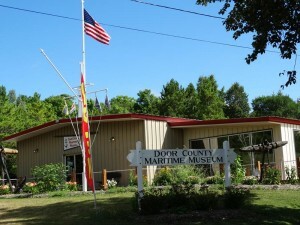 The road then heads north to Gills Rock (once known as Hedgehog Harbor), home of the Door County Maritime Museum and a passenger ferry to Washington Island. 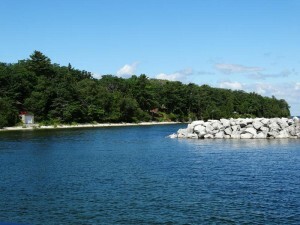 One of two ferry access points to Washington Island, Gills Rock is at the northern end of the peninsula’s edge. The views of both the water and coast make it a place you want to stare at for a while. 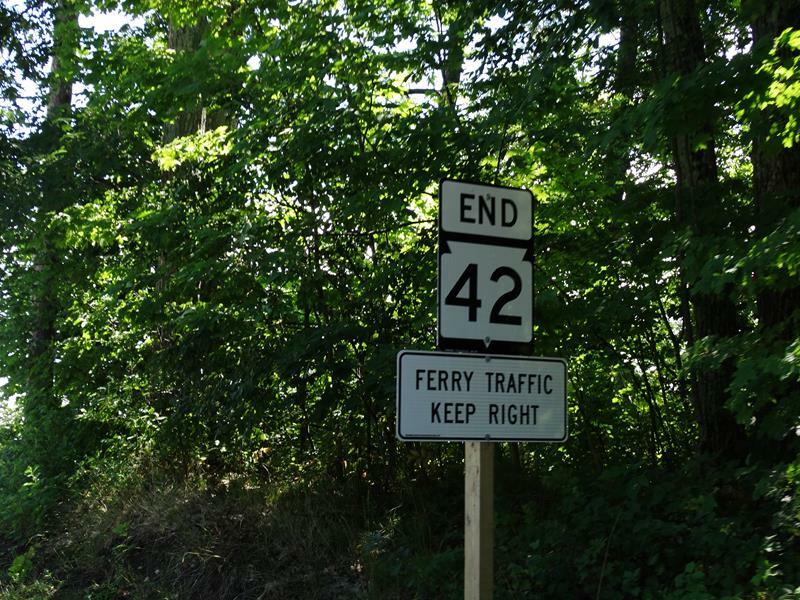 Technically, “Spur” Highway 42 takes you to the ferry at Gills Rock; it runs about 500 yards. Gills Rock is the northernmost point of the Door Peninsula, but Highway 42 manages 2 more miles, pushing east to the very tip via a crazy, slalom-esque path. Back and forth, back and forth you’ll go, zigzagging until you see the water once more – and you’ve reached the end. Road trip slalom! Few roads zig and zag like Highway 42 as it approaches the Northport pier. The only to keep going when you hit the end of Highway 42 is to take the ferry to Washington Island – which on a beautiful day is an awesome thing to do! 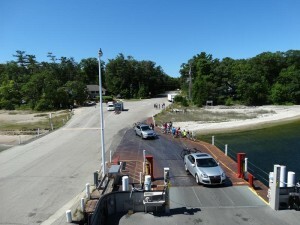 From the Washington Island Ferry, here’s how the end of Highway 42 looks toward the tip of the Door Peninsula. The land goes left, right, and back – you can tell you’re at the tip! 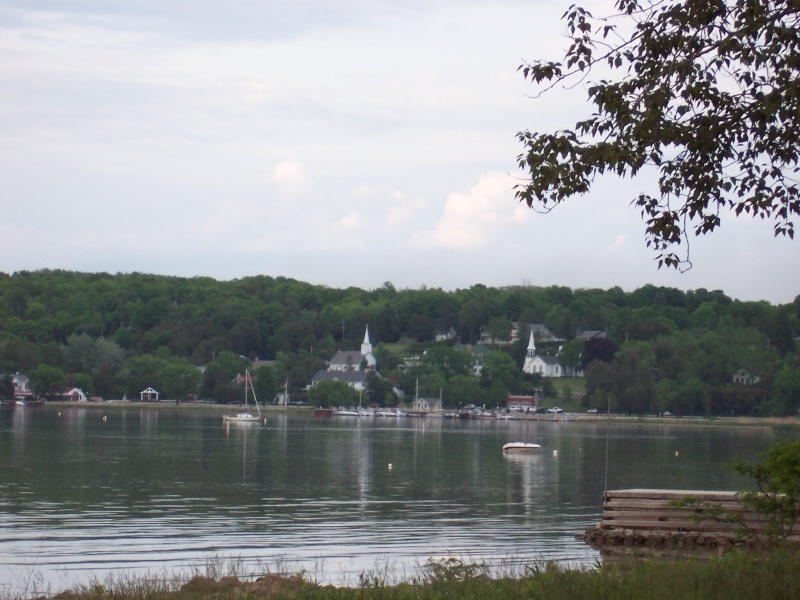 This is Northport, home of the Washington Island Ferry and one restaurant. It’s truly the point where you’re at the tip of the Door Peninsula and the only way to go further is to walk the pier for a few hundred feet. At the edge, just past the “End Highway 42” sign, look back and you’ll see the land goes left and right, but not behind you. ‘Cause you’re at the tip. Look in any other direction and you’re looking at Porte de Morts, or “Death’s Door”, home of swirling waters and a multitude of shipwrecks. Plum, Washington, Detroit and Pilot Islands are all in view. Stop in the restaurant, take the ferry to Washington Island, camp out in Newport State Park… or just relax and marvel for a bit. Then, since going back on Highway 42 is your only option, prepare to zig and zag for the first mile as you make your way back.